When we launched Aurora we also hinted at our plans to apply the same scale-out design principle to other layers of the database stack. Today I would like to tell you about our next step along that path. Each node in the storage layer pictured above also includes plenty of processing power. Aurora is now able to make great use of that processing power by taking your analytical queries (generally those that process all or a large part of a good-sized table) and running them in parallel across hundreds or thousands of storage nodes, with speed benefits approaching two orders of magnitude. Because this new model reduces network, CPU, and buffer pool contention, you can run a mix of analytical and transactional queries simultaneously on the same table while maintaining high throughput for both types of queries. You can use the aurora_pq parameter to enable and disable the use of parallel queries at the global and the session level. Parallel queries enhance the performance of over 200 types of single-table predicates and hash joins. 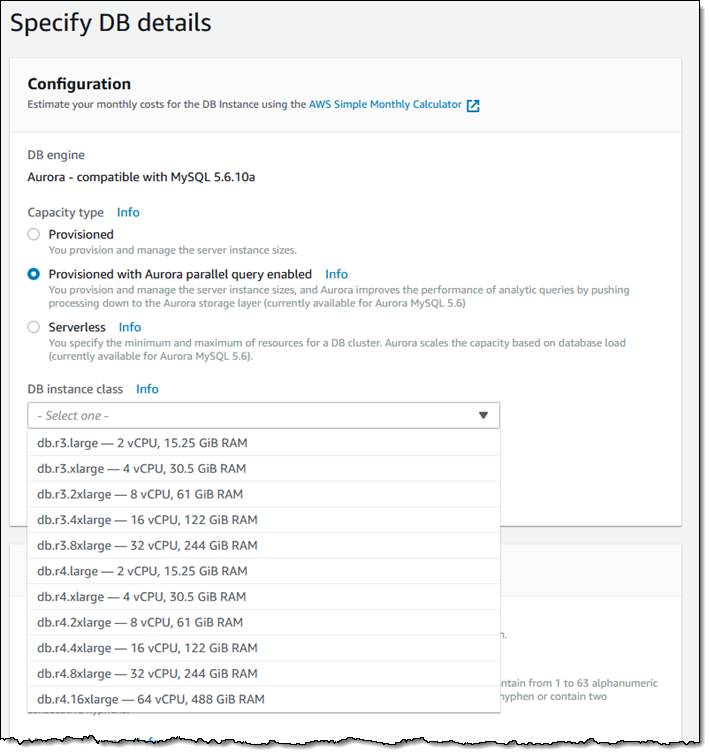 The Aurora query optimizer will automatically decide whether to use Parallel Query based on the size of the table and the amount of table data that is already in memory; you can also use the aurora_pq_force session variable to override the optimizer for testing purposes. You will need to create a fresh cluster in order to make use of the Parallel Query feature. You can create one from scratch, or you can restore a snapshot. Engine Support – We are launching with support for MySQL 5.6, and are working on support for MySQL 5.7 and PostgreSQL. Table Formats – The table row format must be COMPACT; partitioned tables are not supported. Data Types – The TEXT, BLOB, and GEOMETRY data types are not supported. DDL – The table cannot have any pending fast online DDL operations. Cost – You can make use of Parallel Query at no extra charge. However, because it makes direct access to storage, there is a possibility that your IO cost will increase. This feature is available now and you can start using it today! Many customers ask for guidance to migrate end-to-end solutions running in their on-premises data center to AWS. 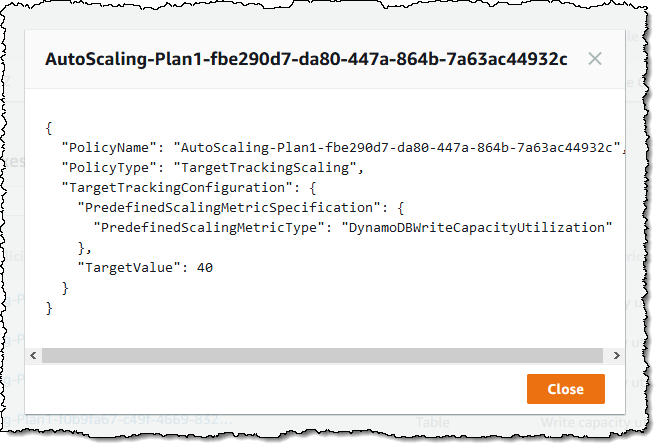 This post provides an overview of moving a common blogging platform, WordPress, running on an on-premises virtualized Microsoft Hyper-V platform to AWS, including re-pointing the DNS records associated to the website. AWS Server Migration Service (AWS SMS) is an agentless service that makes it easier and faster for you to migrate thousands of on-premises workloads to AWS. In November 2017, AWS added support for Microsoft’s Hyper-V hypervisor. AWS SMS allows you to automate, schedule, and track incremental replications of live server volumes, making it easier for you to coordinate large-scale server migrations. In this post, I guide you through migrating your multi-tier workloads using both AWS SMS and AWS Migration Hub. Migration Hub provides a single location to track the progress of application migrations across multiple AWS and partner solutions. 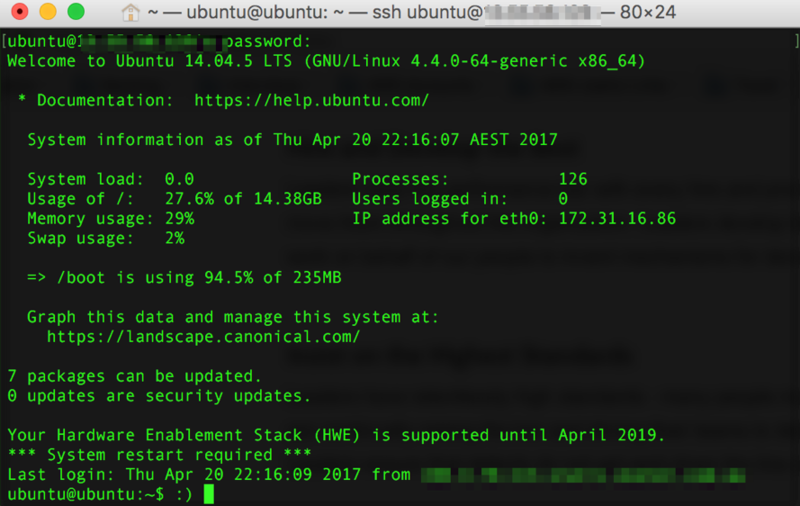 In this post, you use AWS SMS as a mechanism to migrate the virtual machines (VMs) and track them via Migration Hub. You can also use other third-party tools in Migration Hub, and choose the migration tools that best fit your needs. Migration Hub allows you to get progress updates across all migrations, identify and troubleshoot any issues, and reduce the overall time and effort spent on your migration projects. Migration Hub and AWS SMS are both free. You pay only for the cost of the individual migration tools that you use, and any resources being consumed on AWS. For this walkthrough, the WordPress blog is currently running as a two-tier stack in a corporate data center. The example environment is multi-tier and polyglot in nature. The frontend uses Windows Server 2016 (running IIS 10 with PHP as an ISAPI extension) and the backend is supported by a MySQL server running on Ubuntu 16.04 LTS. All systems are hosted on a virtualized platform. As the environment consists of multiple servers, you can use Migration Hub to group the servers together as an application and manage the holistic process of migrating the application. 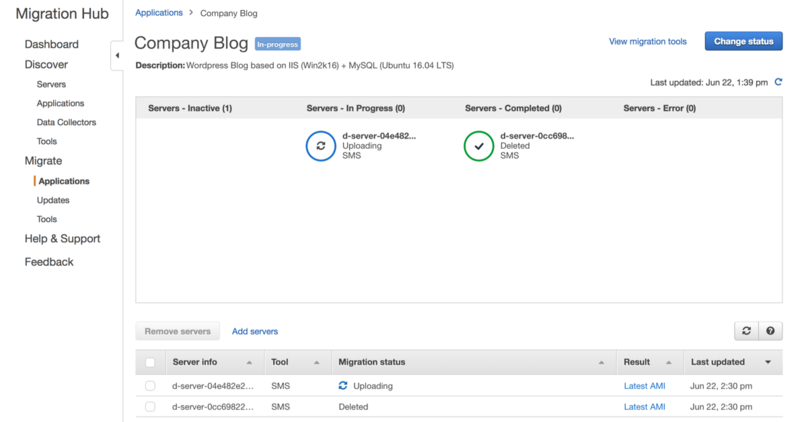 Download the SMS Connector from the AWS Management Console. Configure AWS SMS and Hyper-V permissions. Install and configure the SMS Connector appliance. Import your virtual machine inventory and create a replication job. 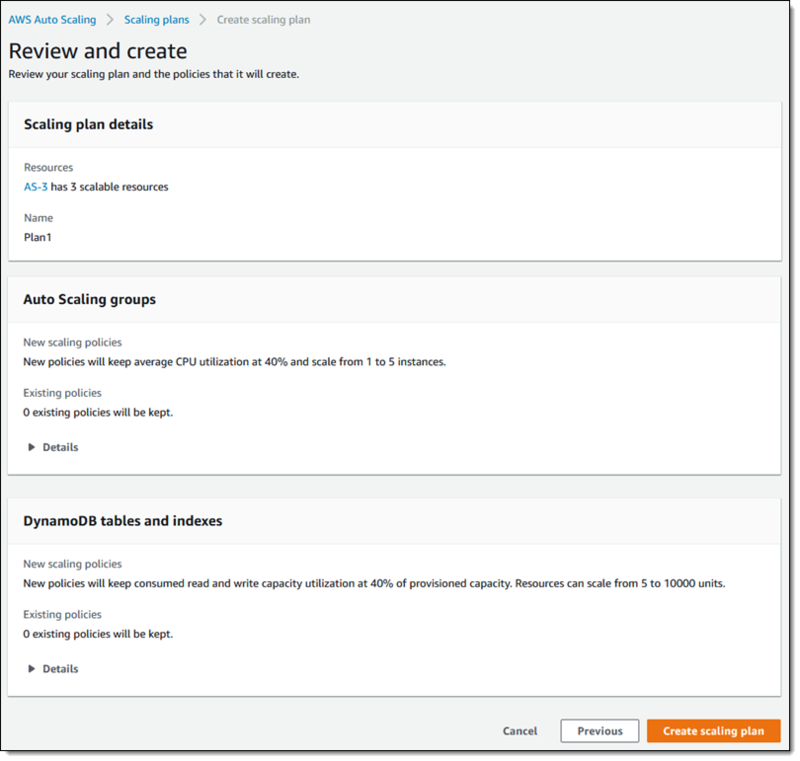 Use AWS Migration Hub to track progress. 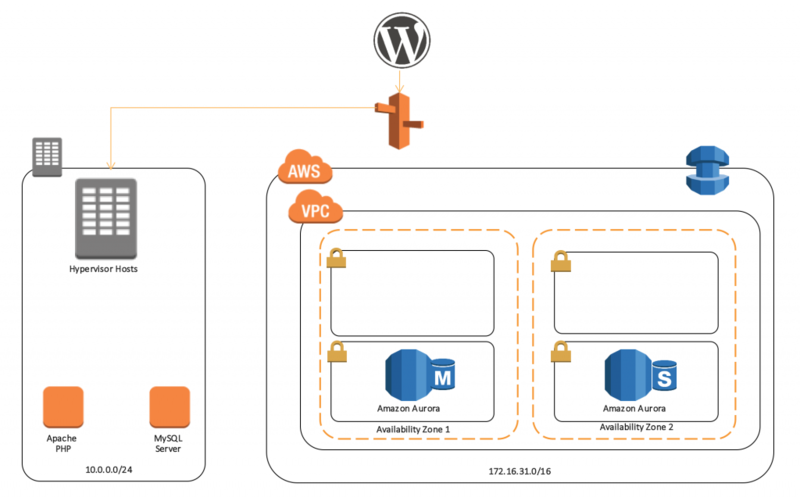 Launch your Amazon EC2 instance. 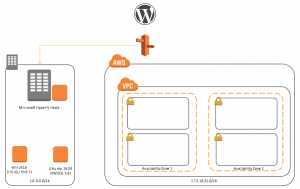 Change your DNS records to resolve the WordPress blog to your EC2 instance. Before you start, ensure that your source systems OS and hypervisor version are supported by AWS SMS. For more information, see the Server Migration Service FAQ. This post focuses on the Microsoft Hyper-V hypervisor. First, establish your AWS environment. If your organization is new to AWS, this may include account or subaccount creation, a new virtual private cloud (VPC), and associated subnets, route tables, internet gateways, and so on. Think of this phase as setting up your software-defined data center. For more information, see Getting Started with Amazon EC2 Linux Instances. The blog is a two-tier stack, so go with two private subnets. Because you want it to be highly available, use multiple Availability Zones. An Availability Zone resides within an AWS Region. Each Availability Zone is isolated, but the zones within a Region are connected through low-latency links. This allows architects and solution designers to build highly available solutions. 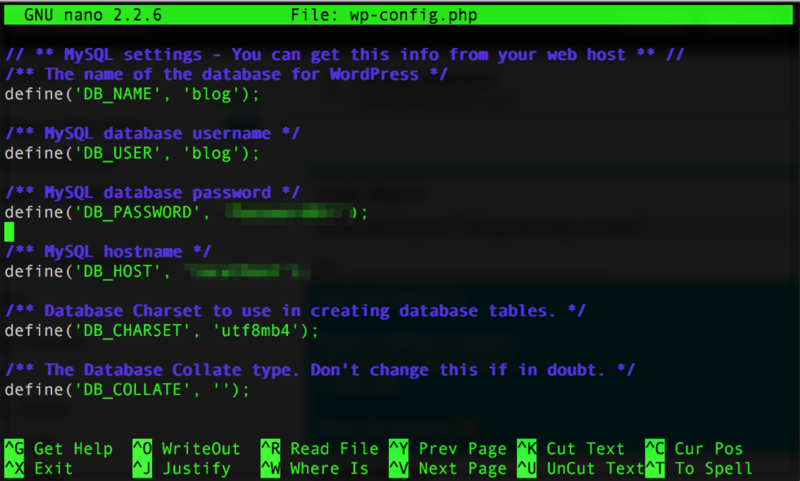 WordPress uses a MySQL relational database. You could continue to manage MySQL and the associated EC2 instances associated with maintaining and scaling a database. But for this walkthrough, I am using this opportunity to migrate to an RDS instance of Amazon Aurora, as it is a MySQL-compliant database. Not only is Amazon Aurora a high-performant database engine but it frees you up to focus on application development by managing time-consuming database administration tasks, including backups, software patching, monitoring, scaling, and replication. Use AWS Database Migration Service (AWS DMS) to migrate your MySQL database to Amazon Aurora easily and securely. 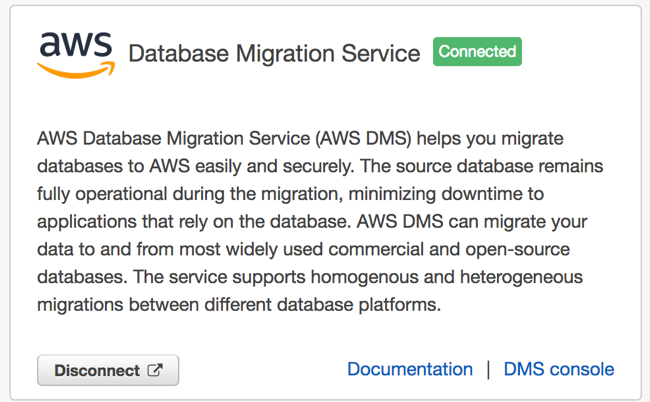 You can send the results from AWS DMS to Migration Hub. This allows you to create a single pane view of your application migration. After a database migration instance has been instantiated, configure the source and destination endpoints and create a replication task. By attaching to the MySQL binlog, you can seed in the current data in the database and also capture all future state changes in near–real time. 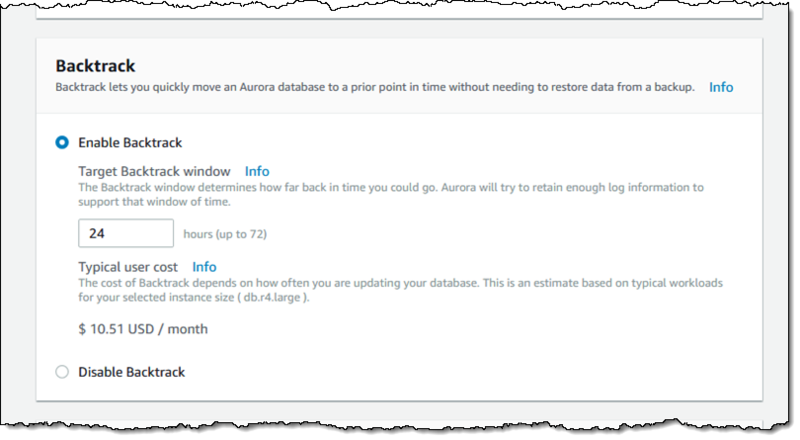 For more information, see Migrating a MySQL-Compatible Database to Amazon Aurora. Finally, the task shows that you are replicating current data in your WordPress blog database and future changes from MySQL into Amazon Aurora. Now, use AWS SMS to migrate your IIS/PHP frontend. AWS SMS is delivered as a virtual appliance that can be deployed in your Hyper-V environment. To download the SMS Connector, log in to the console and choose Server Migration Service, Connectors, SMS Connector setup guide. Download the VHD file for SCVMM/Hyper-V.
SMS – Use the AWS CLI or console to create an IAM user with the ServerMigrationConnector policy attached. 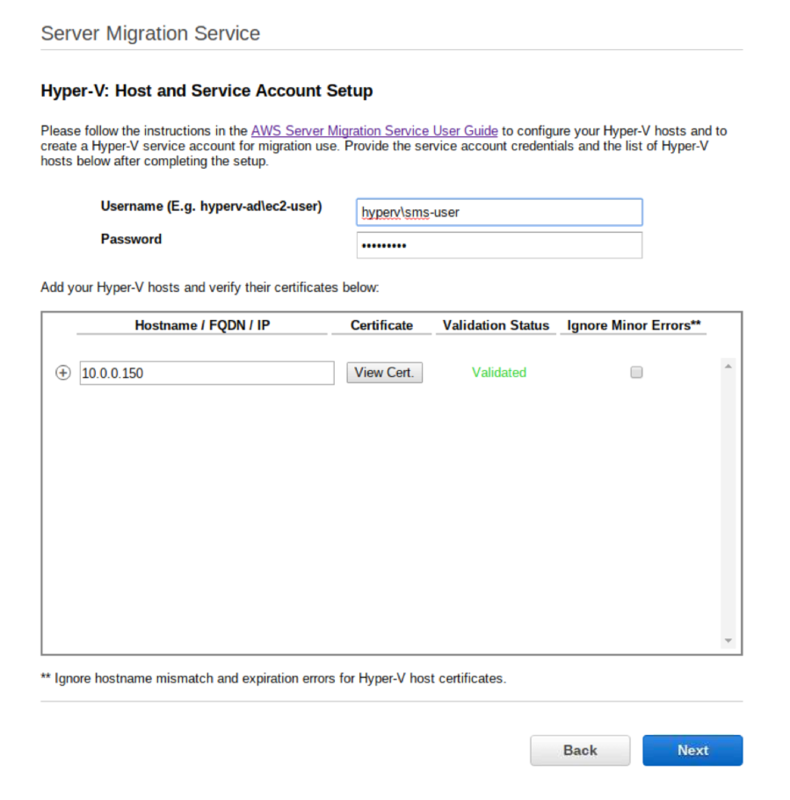 Hypervisor – Follow the specific instructions for your hypervisor in the Getting Started with AWS Server Migration Service tutorial. Launch a new VM in Hyper-V based on the SMS Connector that you downloaded. To configure the connector, connect to it via HTTPS. 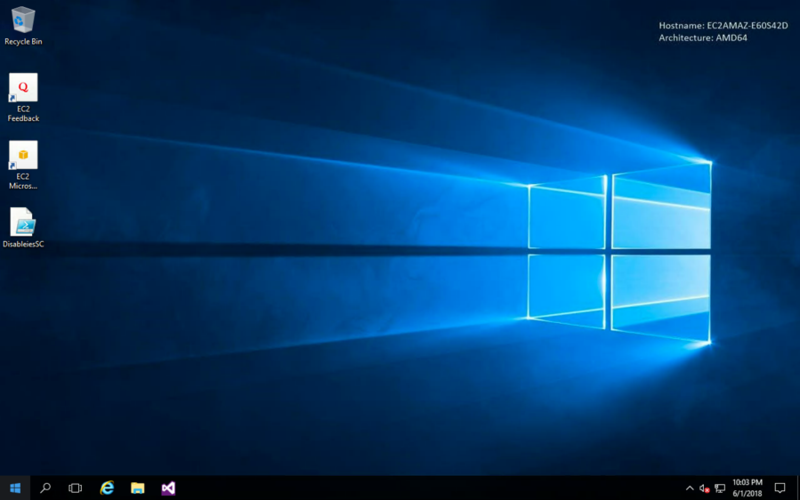 You can obtain the SMS Connector IP address from within Hyper-V. By default, the SMS Connector uses DHCP to obtain a valid IP address. Connect to the SMS Connector via HTTPS. In the example above, the connector IP address is 10.0.0.88. In your browser, enter https://10.0.0.88. As the SMS Connector can only work with one hypervisor at a time, you must state the hypervisor with which to interface. For the purpose of this post, the examples use Microsoft Hyper-V.
Configure the connector with the IAM and hypervisor credentials that you created earlier. After you have entered in both your AWS and Hyper-V credentials and the associated connectivity and authentication checks have passed, you are redirected to the home page of your SMS Connector. The home page provides you a status on connectivity and the health of the SMS Connector. You also must modify your Hyper-V hosts to provide WinRM connectivity. 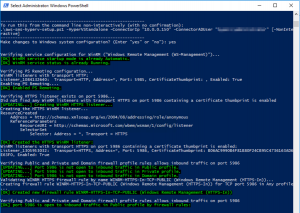 AWS provides a downloadable PowerShell script to configure your Windows environment to support WinRM communications with the SMS Connector. The same script is used for configuring either standalone Hyper-V or SCVMM. 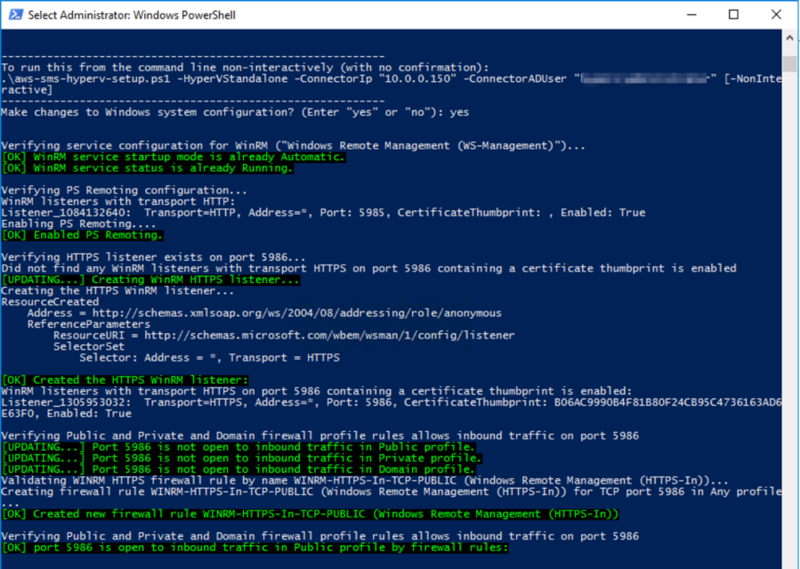 Execute the PowerShell script and follow the prompts. In the following example, Reconfigure Hyper-V not managed by SCVMM (Standalone Hyper-V)… was selected. You have now configured the SMS Connector and your Microsoft Hyper-V hosts. 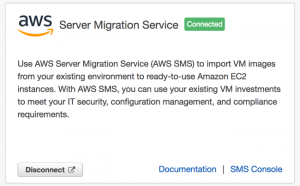 Switch to the console to import your server catalog to AWS SMS. Within AWS SMS, choose Connectors, Import Server Catalog. This process can take up to a few minutes and is dependent on the number of machines in your Hyper-V inventory. 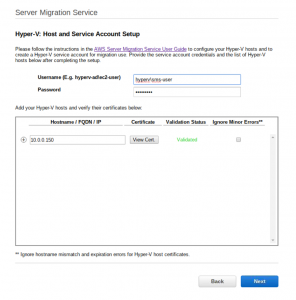 Select the server to migrate and choose Create replication job. The console guides you through the process. The time that the initial replication task takes to complete is dependent on the available bandwidth and the size of your VM. After the initial seed replication, network bandwidth is minimized as AWS SMS replicates only incremental changes occurring on the VM. You have now successfully started your database migration via AWS DMS, set up your SMS Connector, configured your Microsoft Hyper-V environment, and started a replication job. 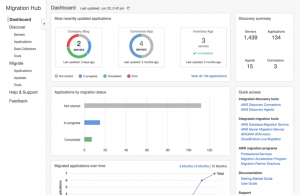 You can now track the collective progress of your application migration. 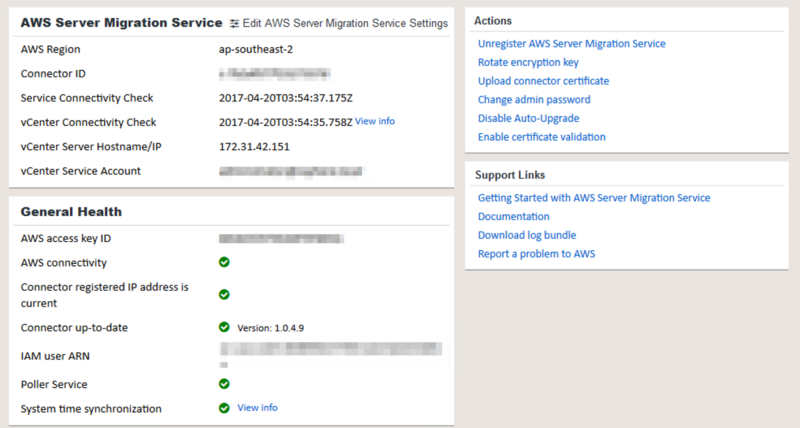 To track migration progress, connect AWS DMS and AWS SMS to Migration Hub. 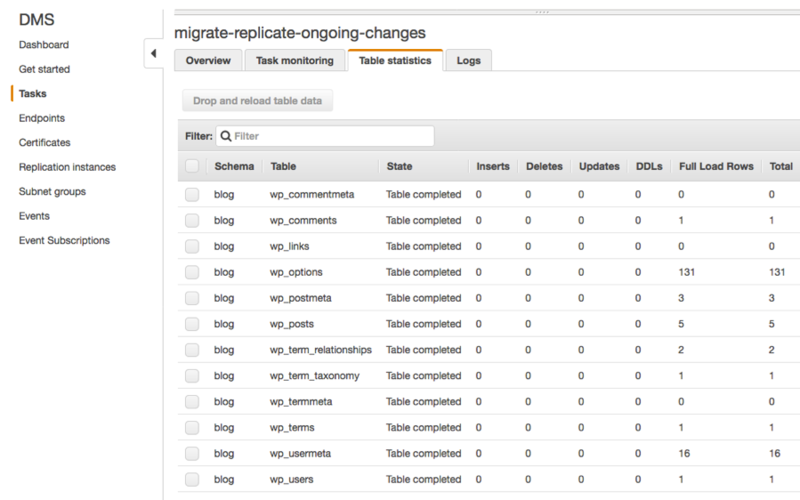 To do this, navigate to Migration Hub in the AWS Management Console. Under Migrate and Tools, connect both services so that the migration status of these services is sent to Migration Hub. You can then group your servers into an application in Migration Hub and collectively track the progress of your migration. In this example, I created an application, Company Blog, and added in my servers from both AWS SMS and AWS DMS. The progress updates from linked services are automatically sent to Migration Hub so that you can track tasks in progress. The dashboard reflects any status changes that occur in the linked services. You can see from the following image that one server is complete while another is in progress. 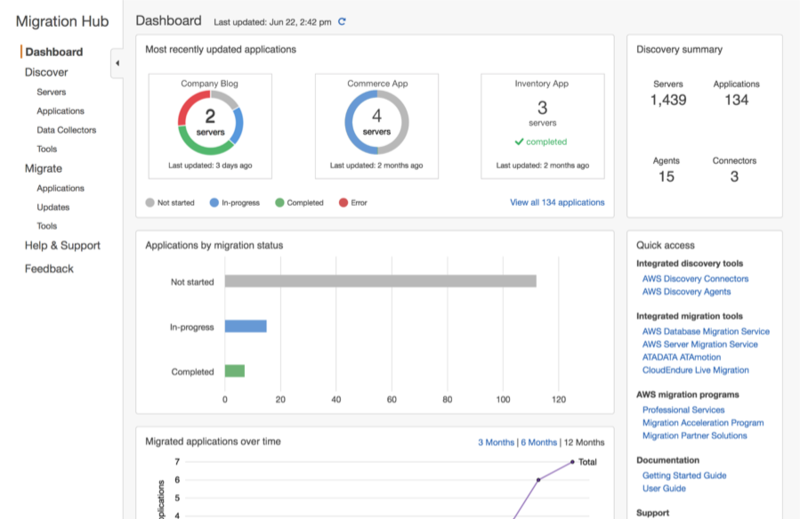 Using Migration Hub, you can view the migration progress of all applications. This allows you to quickly get progress updates across all of your migrations, easily identify and troubleshoot any issues, and reduce the overall time and effort spent on your migration projects. 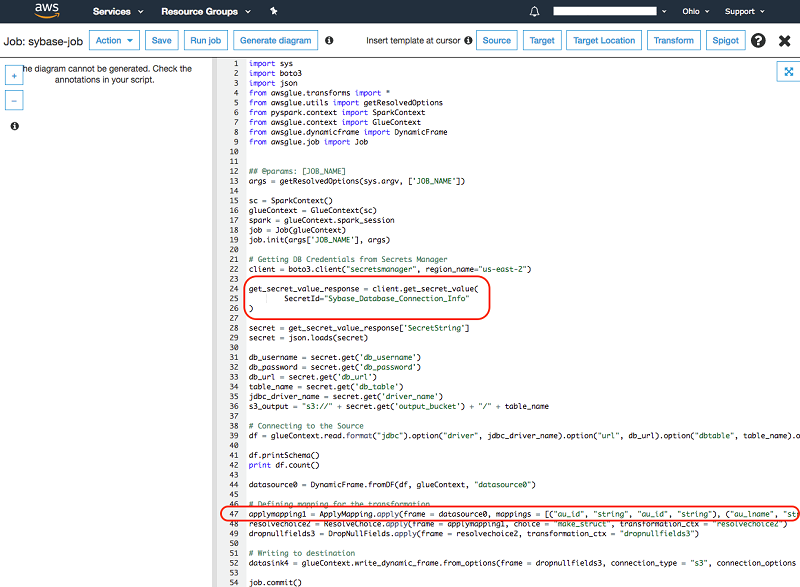 When your replication task is complete, the artifact created by AWS SMS is a custom AMI that you can use to deploy an EC2 instance. Follow the usual process to launch your EC2 instance, using the custom AMI created by AWS SMS, noting that you may need to replace any host-based firewalls with security groups and NACLs. When you create an EC2 instance, ensure that you pick the most suitable EC2 instance type and size to match your performance requirements while optimizing for cost. While your new EC2 instance is a replica of your on-premises VM, you should always validate that applications are functioning. How you do this differ on an application-by-application basis. You can use a combination of approaches, such as editing a local host file and testing your application, SSH, RDP, and Telnet. 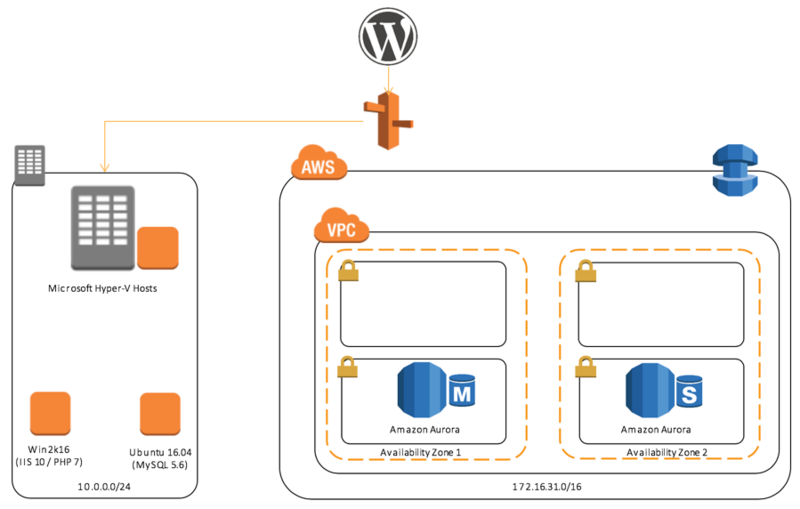 From the RDS console, get your connection string details and update your WordPress configuration file to point to the Amazon Aurora database. As WordPress is expecting a MySQL database and Amazon Aurora is MySQL-compliant, this change of database engine is transparent to WordPress. 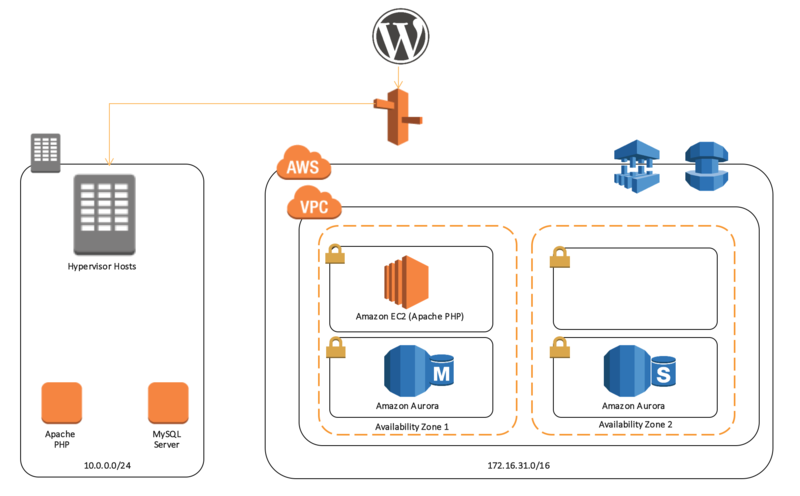 You have validated that your WordPress application is running correctly, as you are still receiving changes from your on-premises data center via AWS DMS into your Amazon Aurora database. You can now update your DNS zone file using Amazon Route 53. Amazon Route 53 can be driven by multiple methods: console, SDK, or AWS CLI. For this walkthrough, use Windows PowerShell for AWS to update the DNS zone file. 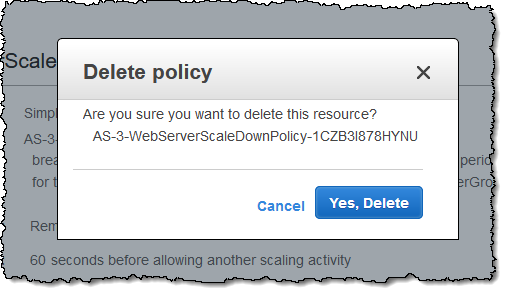 The example shows UPSERTING the A record in the zone to resolve to the Amazon EC2 instance created with AWS SMS. Based on the TTL of your DNS zone file, end users slowly resolve the WordPress blog to AWS. 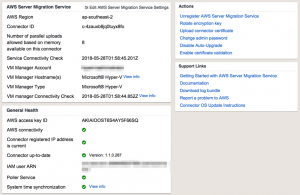 You have now successfully migrated your WordPress blog to AWS using AWS migration services, specifically the AWS SMS Hyper-V/SCVMM Connector. Your blog now resolves to AWS. After validation, you are ready to decommission your on-premises resources. This paradigm is great for applications with unpredictable load or infrequent demand. I’m excited to show you how this all works. Let me show you how to launch a serverless cluster. From here I can select a number of options. I can specify the minimum and maximum number of Aurora Compute Units (ACU) to be consumed. These are billed per-second, with a 5-minute minimum, and my cluster will autoscale between the specified minimum and maximum number of ACUs. 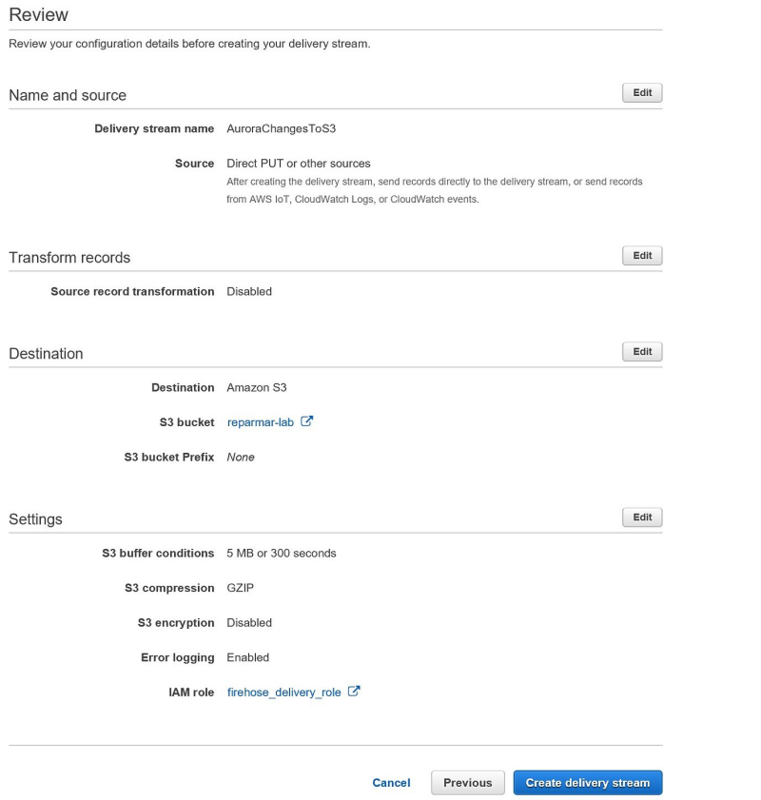 The rules and metrics for autoscaling will be automatically created by Aurora Serverless and will include CPU utilization and number of connections. When Aurora Serverless detects that my cluster needs additional capacity it will grab capacity from a warm pool of resources to meet the need. This new capacity can start serving traffic in seconds because of the separation of the compute layer and storage layer intrinsic to the design of Aurora. 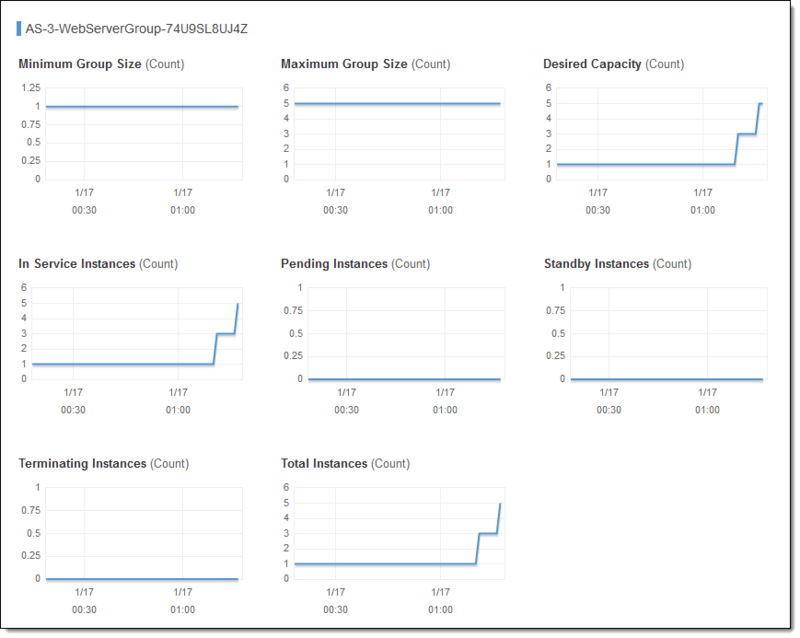 The cluster can even automatically scale down to zero if my cluster isn’t seeing any activity. This is perfect for development databases that might go long periods of time with little or no use. When the cluster is paused I’m only charged for the underlying storage. If I want to manually scale up or down, pre-empting a large spike in traffic, I can easily do that with a single API call. 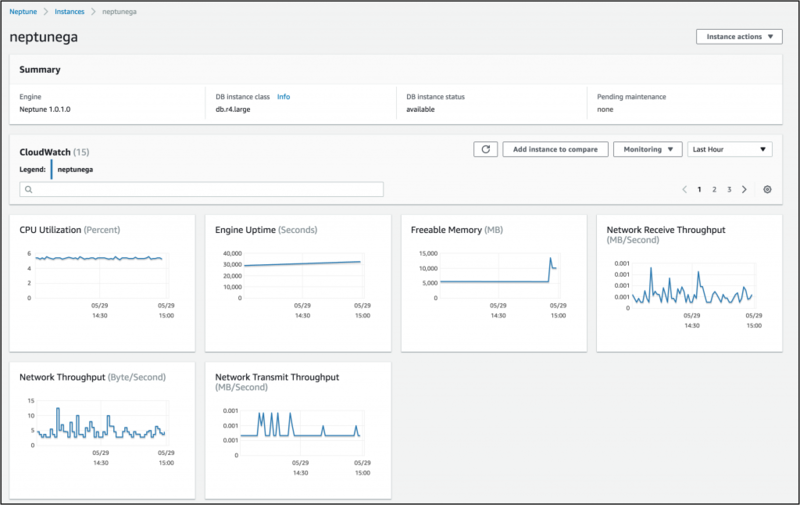 When the cluster needs to autoscale up or down or resume after a pause, Aurora grabs capacity from a pool of already available nodes and adds them to the request routers. This process takes almost no time and since the storage is shared between nodes Aurora can scale up or down in seconds for most workloads. The service currently has autoscaling cooldown periods of 1.5 minutes for scaling up and 5 minutes for scaling down. Scaling operations are transparent to the connected clients and applications since existing connections and session state are transferred to the new nodes. The only difference with pausing and resuming is a higher latency for the first connection, typically around 25 seconds. Aurora Serverless for Aurora MySQL is available now in US East (N. Virginia), US East (Ohio), US West (Oregon), Europe (Ireland). If you’re interested in learning more about the Aurora engine there’s a great design paper available. If you’re interested in diving a bit deeper on exactly how Aurora Serverless works then look forward to more detail in future posts! Many of my colleagues are fortunate to be able to spend a good part of their day sitting down with and listening to our customers, doing their best to understand ways that we can better meet their business and technology needs. This information is treated with extreme care and is used to drive the roadmap for new services and new features. AWS customers in the financial services industry (often abbreviated as FSI) are looking ahead to the Fundamental Review of Trading Book (FRTB) regulations that will come in to effect between 2019 and 2021. Among other things, these regulations mandate a new approach to the “value at risk” calculations that each financial institution must perform in the four hour time window after trading ends in New York and begins in Tokyo. Today, our customers report this mission-critical calculation consumes on the order of 200,000 vCPUs, growing to between 400K and 800K vCPUs in order to meet the FRTB regulations. While there’s still some debate about the magnitude and frequency with which they’ll need to run this expanded calculation, the overall direction is clear. In order to make sure that we are ready to help our FSI customers meet these new regulations, we worked with TIBCO to set up and run a proof of concept grid in the AWS Cloud. The periodic nature of the calculation, along with the amount of processing power and storage needed to run it to completion within four hours, make it a great fit for an environment where a vast amount of cost-effective compute power is available on an on-demand basis. Our customers are already using the TIBCO GridServer on-premises and want to use it in the cloud. This product is designed to run grids at enterprise scale. It runs apps in a virtualized fashion, and accepts requests for resources, dynamically provisioning them on an as-needed basis. The cloud version supports Amazon Linux as well as the PostgreSQL-compatible edition of Amazon Aurora. If you plan to create a grid of this size, you should also bring your friendly local AWS Solutions Architect into the loop as early as possible. They will review your plans, provide you with architecture guidance, and help you to schedule your run. We hit the Go button and launched the grid, watching as it bid for and obtained Spot Instances, each of which booted, initialized, and joined the grid within two minutes. The test workload used the Strata open source analytics & market risk library from OpenGamma and was set up with their assistance. The grid grew to 61,299 Spot Instances (1.3 million vCPUs drawn from 34 instance types spanning 3 generations of EC2 hardware) as planned, with just 1,937 instances reclaimed and automatically replaced during the run, and cost $30,000 per hour to run, at an average hourly cost of $0.078 per vCPU. If the same instances had been used in On-Demand form, the hourly cost to run the grid would have been approximately $93,000. Despite the scale of the grid, prices for the EC2 instances did not move during the bidding process. This is due to the overall size of the AWS Cloud and the smooth price change model that we launched late last year. To give you a sense of the compute power, we computed that this grid would have taken the #1 position on the TOP 500 supercomputer list in November 2007 by a considerable margin, and the #2 position in June 2008. Today, it would occupy position #360 on the list. I hope that you enjoyed this AWS success story, and that it gives you an idea of the scale that you can achieve in the cloud! 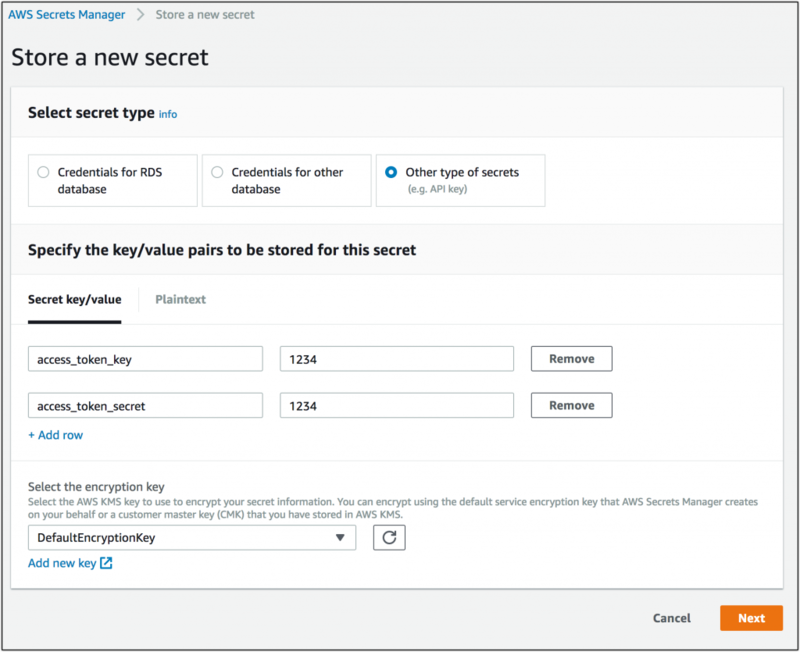 Today we’re launching AWS Secrets Manager which makes it easy to store and retrieve your secrets via API or the AWS Command Line Interface (CLI) and rotate your credentials with built-in or custom AWS Lambda functions. 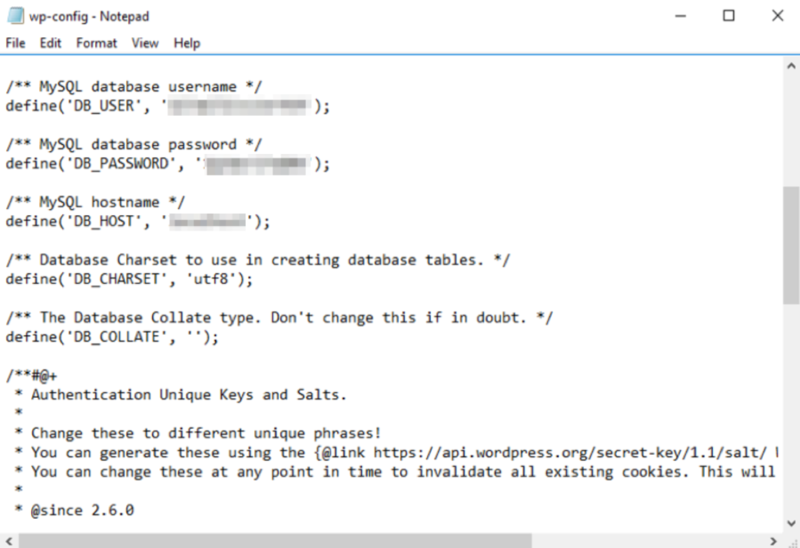 Managing application secrets like database credentials, passwords, or API Keys is easy when you’re working locally with one machine and one application. As you grow and scale to many distributed microservices, it becomes a daunting task to securely store, distribute, rotate, and consume secrets. Previously, customers needed to provision and maintain additional infrastructure solely for secrets management which could incur costs and introduce unneeded complexity into systems. Imagine that I have an application that takes incoming tweets from Twitter and stores them in an Amazon Aurora database. Previously, I would have had to request a username and password from my database administrator and embed those credentials in environment variables or, in my race to production, even in the application itself. I would also need to have our social media manager create the Twitter API credentials and figure out how to store those. This is a fairly manual process, involving multiple people, that I have to restart every time I want to rotate these credentials. 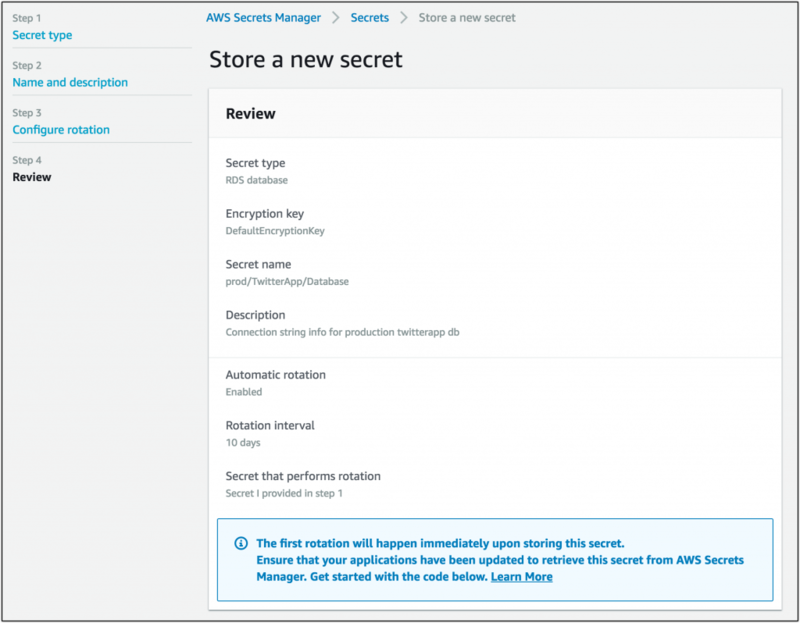 With Secrets Manager my database administrator can provide the credentials in secrets manager once and subsequently rely on a Secrets Manager provided Lambda function to automatically update and rotate those credentials. 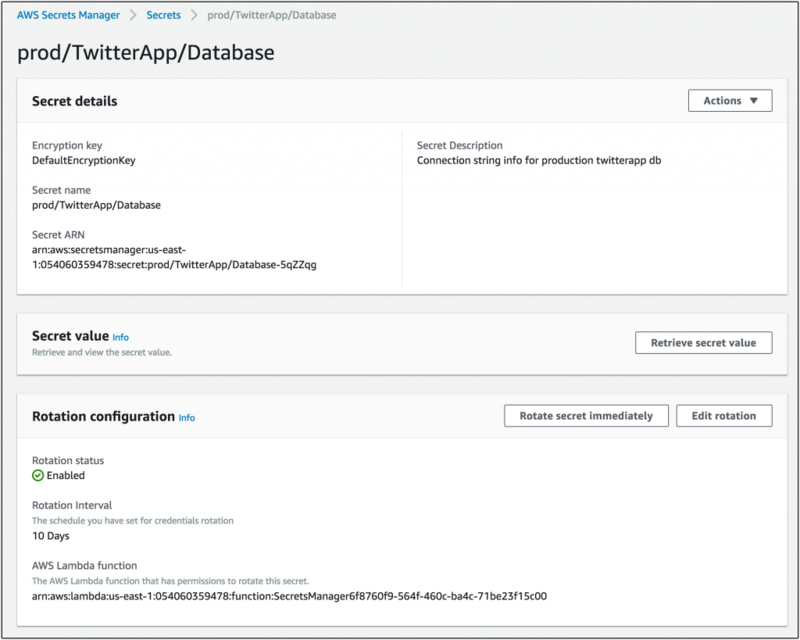 My social media manager can put the Twitter API keys in Secrets Manager which I can then access with a simple API call and I can even rotate these programmatically with a custom lambda function calling out to the Twitter API. My secrets are encrypted with the KMS key of my choice, and each of these administrators can explicitly grant access to these secrets with with granular IAM policies for individual roles or users. 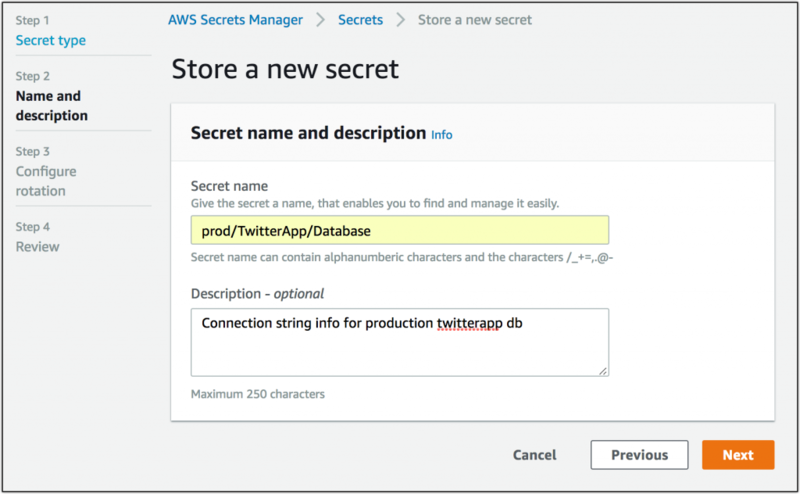 Let’s take a look at how I would store a secret using the AWS Secrets Manager console. First, I’ll click Store a new secret to get to the new secrets wizard. 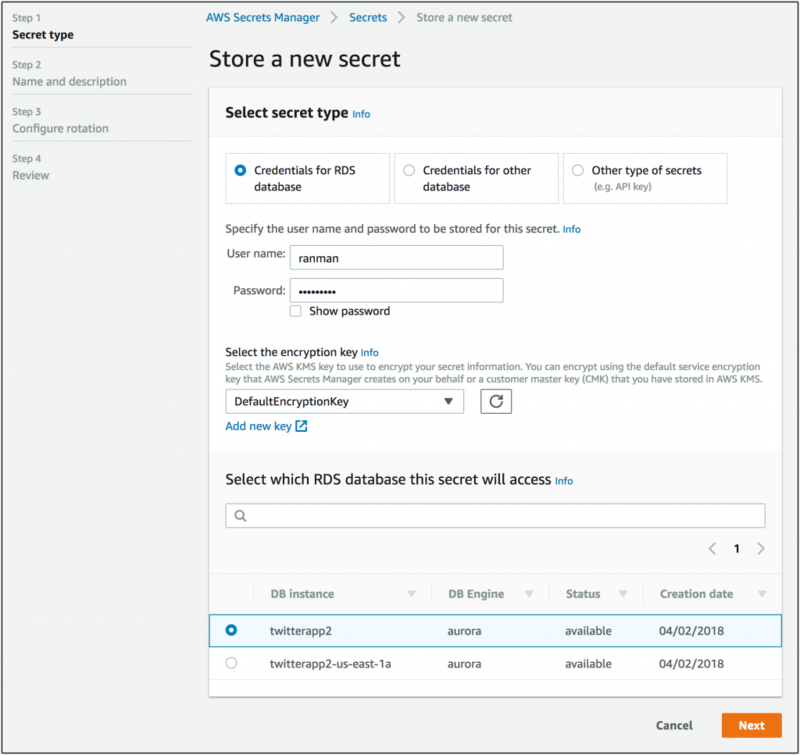 For my RDS Aurora instance it’s straightforward to simply select the instance and provide the initial username and password to connect to the database. Next, I’ll fill in a quick description and a name to access my secret by. You can use whatever naming scheme you want here. Next, we’ll configure rotation to use the Secrets Manager-provided Lambda function to rotate our password every 10 days. Finally, we’ll review all the details and check out our sample code for storing and retrieving our secret! Finally I can review the secrets in the console. Now, if I needed to access these secrets I’d simply call the API. AWS Secrets Manager works for more than just passwords. I can store OAuth credentials, binary data, and more. Let’s look at storing my Twitter OAuth application keys. Now, I can define the rotation for these third-party OAuth credentials with a custom AWS Lambda function that can call out to Twitter whenever we need to rotate our credentials. 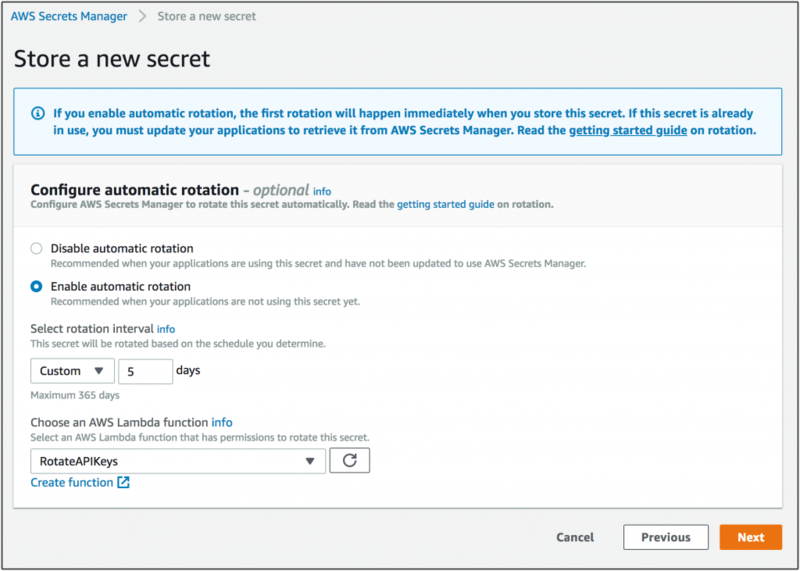 One of the niftiest features of AWS Secrets Manager is custom AWS Lambda functions for credential rotation. This allows you to define completely custom workflows for credentials. Secrets Manager will call your lambda with a payload that includes a Step which specifies which step of the rotation you’re in, a SecretId which specifies which secret the rotation is for, and importantly a ClientRequestToken which is used to ensure idempotency in any changes to the underlying secret. The advantage of these steps is that you can add any kind of approval steps you want for each phase of the rotation. For more details on custom rotation check out the documentation. 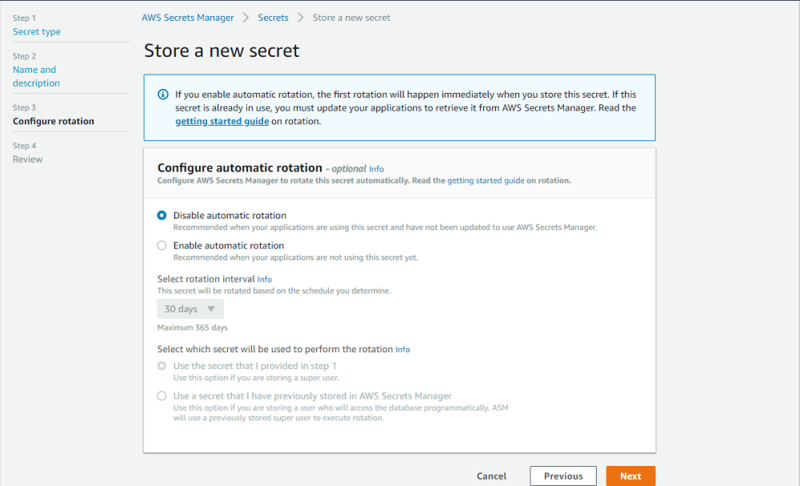 AWS Secrets Manager is available today in US East (N. Virginia), US East (Ohio), US West (N. California), US West (Oregon), Asia Pacific (Mumbai), Asia Pacific (Seoul), Asia Pacific (Singapore), Asia Pacific (Sydney), Asia Pacific (Tokyo), Canada (Central), EU (Frankfurt), EU (Ireland), EU (London), and South America (São Paulo). Secrets are priced at $0.40 per month per secret and $0.05 per 10,000 API calls. I’m looking forward to seeing more users adopt rotating credentials to secure their applications! The Amazon RDS team launched nearly 80 features in 2017. Some of them were covered in this blog, others on the AWS Database Blog, and the rest in What’s New or Forum posts. To wrap up my week, I thought it would be worthwhile to give you an organized recap. So here we go! January – FedRAMP Certification for Amazon RDS for MySQL, Oracle, and PostgreSQL. February – Forced SSL Support for SQL Server. April – Access Management for MySQL and Aurora Using IAM. June – TDE Encrypted Cross-Region Snapshots for RDS SQL Server and Oracle. June – RDS Encryption at Rest for Additional T2 Instance Types. September – Migration of Encrypted RDS MySQL to Aurora. September – HIPAA Eligibility for RDS for SQL Server and RDS for MariaDB. January – Advanced Auditing for Amazon Aurora. 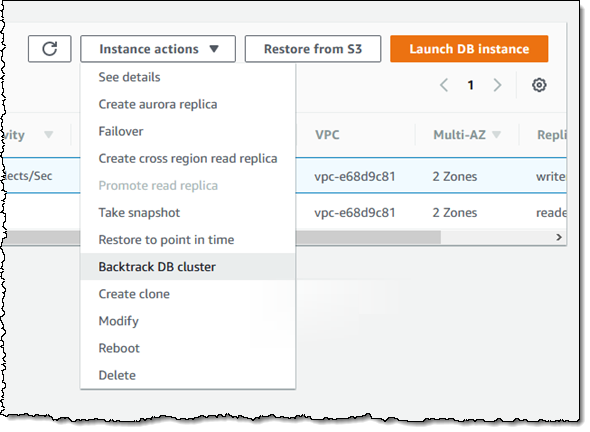 January – RDS MySQL to Aurora Replication in Same Region. January – Cross-Region Read Replicas of Encrypted Database Instances. 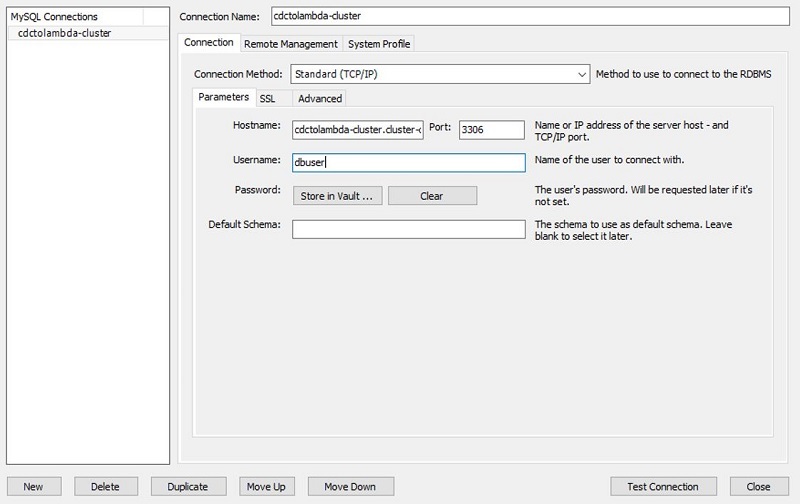 January – Outbound Oracle Network Access Using Custom DNS Servers. March – Cross-Region Snapshot Copy, Cross-Region Replication, Cross-Account Snapshot Sharing for Aurora. April – Fast, Online DDL Processing for Aurora. May – Linux Huge Page Support for Amazon RDS for PostgreSQL. 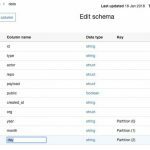 June – Amazon Aurora Select Into Amazon S3. June – Stopping and Starting of RDS Database Instances. 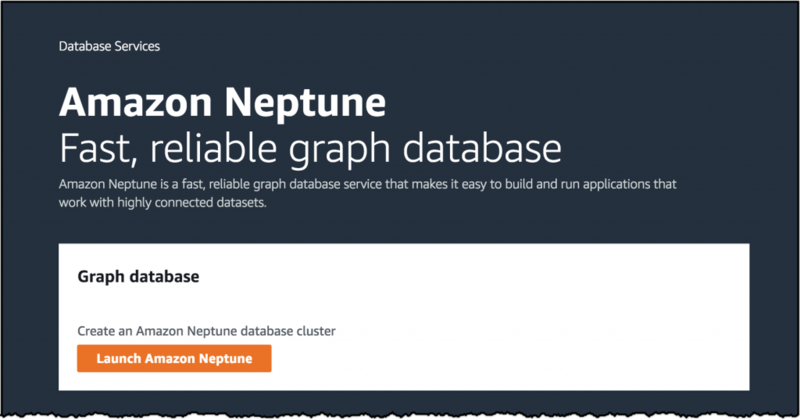 June – Amazon Aurora Copy on Write Database Cloning. August – Amazon Aurora Fast Database Cloning. August – 16 TB Maximum Database Storage Size for SQL Server. September – Open Preview of Performance Insights for Aurora PostgreSQL. 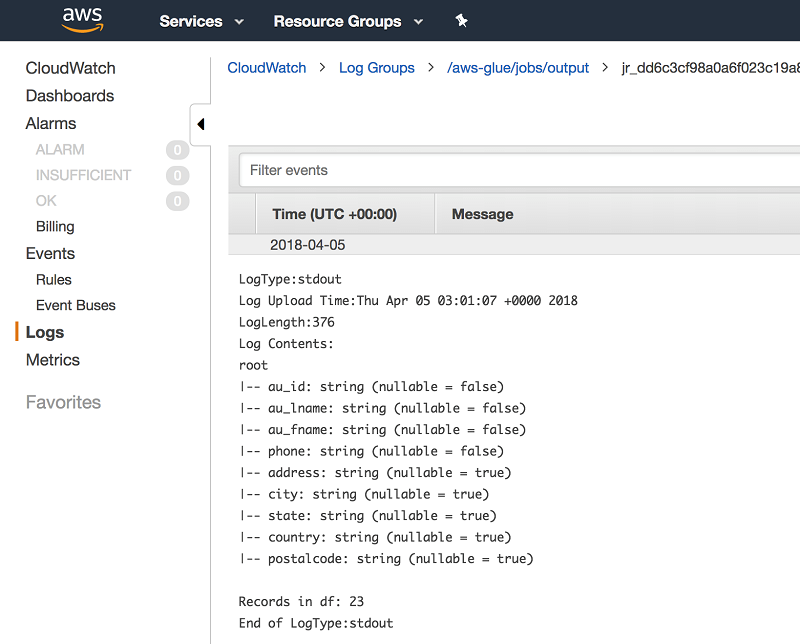 September – Amazon Aurora Audit Log Upload to CloudWatch Logs. 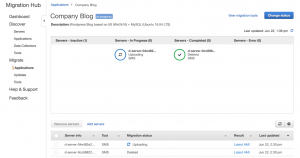 October – Size Flexibility for Amazon RDS Reserved Instances. October – General Availability of Amazon Aurora with PostgreSQL Compatibility. October – Amazon Aurora for MySQL Asynchronous Key Prefetch. October – Amazon RDS For Oracle Support for Oracle SQLT Diagnostics Tool. November – Restore MySQL Backup to Amazon RDS MySQL Database. November – Auto Scaling for Aurora Replicas. 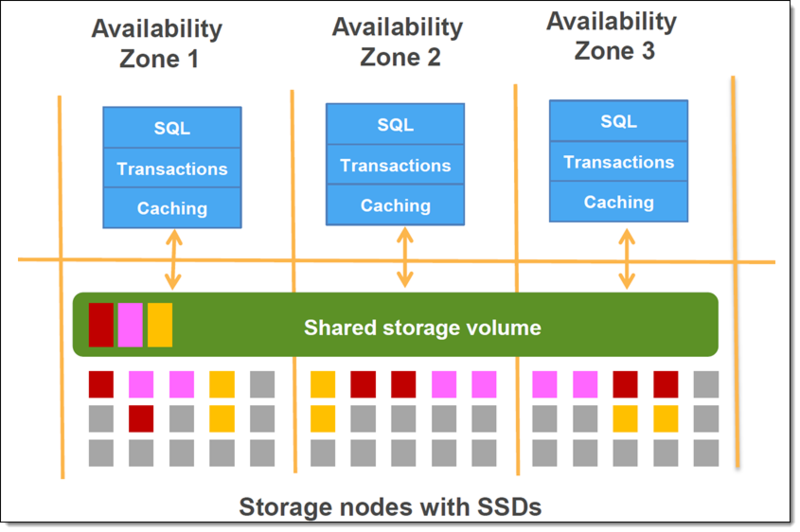 November – Scaling of Storage Size for Amazon RDS for SQL Server. November – Up to 16 TB of Storage & Faster Scaling for Amazon RDS for MySQL, MariaDB, Oracle, and PostgreSQL. 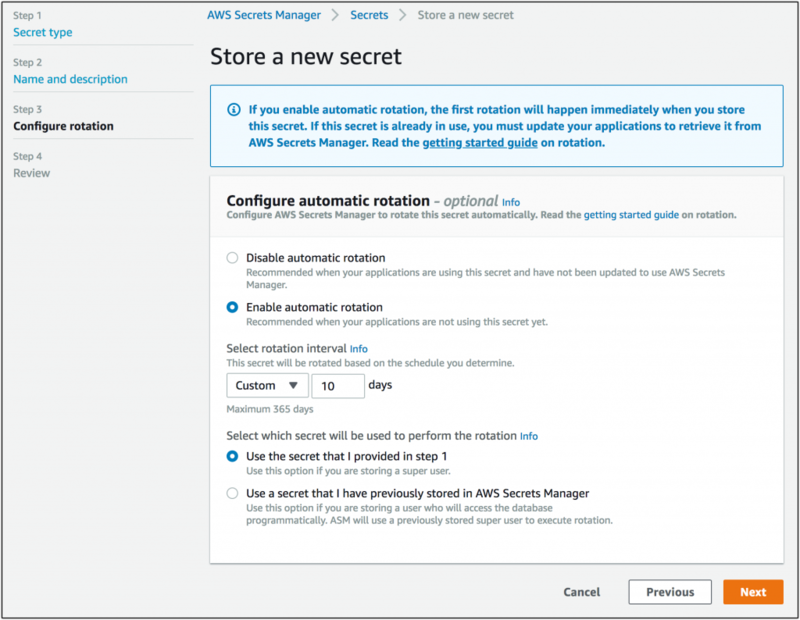 November – Amazon RDS for SQL Server Storage Reconfiguration on Snapshot Restore. November – Amazon RDS for PostgreSQL Support for the pgrouting and postrgresql-hll Extensions, HyperLogLog Data, and decoder_raw Module. December – Batched Scans and Hashed Joins for Aurora with MySQL Compatibility. April – Open Preview of Aurora for PostgreSQL. May – Amazon RDS Support for Versions 9.6.2, 9.5.6, 9.4.11 and 9.3.16 of PostgreSQL. May – Oracle Patch Set Upgrades (PSU) for April 2017. June – Amazon RDS Support for Versions 9.6.2, 9.5.6, 9.4.11, and 9.3.16 in the AWS GovCloud (US) Region. June – SQL Server 2016 Service Pack 1 (SP1). 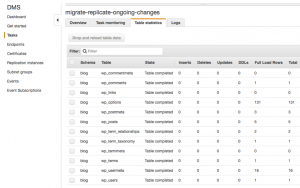 July – Amazon RDS for Oracle Supports HugePages. July – Amazon RDS for SQL Server Enterprise Edition with License Included in More Regions. July – Oracle SE2 License Included Available in AWS GovCloud (US). July – MariaDB 10.1.23 and 10.0.31. July – PostgreSQL 9.6.3, 9.5.7, 9.4.12, and 9.3.17. September – PostgreSQL 9.6.3, 9.5.7, 9.4.12, and 9.3.17 in AWS GovCloud (US). September – Amazon RDS for Oracle Support for Oracle APEX. September – Amazon RDS for Oracle Support for Oracle Multimedia, Spatial, and Locator Options. September – Amazon RDS for Oracle Support for Customer-Initiated Snapshot Upgrades for Deprecated Database Versions. November – Amazon RDS for Oracle Support for Oracle Enterprise Manager Cloud Control 13c1 and 13c2. November – PostgreSQL 9.6.5, 9.5.9, 9.4.14, and 9.3.19 in Commercial and AWS GovCloud (US). November – Oracle Patch Set Upgrades (PSU) for July 2017. November – SQL Server 2016 SP1 CU5 and SQL Server 2017. November – MariaDB 10.1.26 and 10.0.32. December – Oracle Patch Set Upgrades (PSU) for October 2017. March – Aurora in the US West (N. California) Region. June – Aurora in the EU (Frankfurt) Region. July – Windows Authentication for RDS for SQL Server in More Regions. August – Multi-AZ for RDS SQL Server in the EU (Frankfurt) Region. November – Amazon Aurora for PostgreSQL in the Canada (Central), EU (Frankfurt), Asia Pacific (Sydney), and Asia Pacific (Mumbai) Regions. December – Amazon Aurora for PostgreSQL in the EU (Paris) Region. March – Aurora on T2.Small Instances. June – RDS on M4 Instances in the São Paulo Region. October – Amazon RDS for Oracle on New R4, T2, and M4 Instance Types. 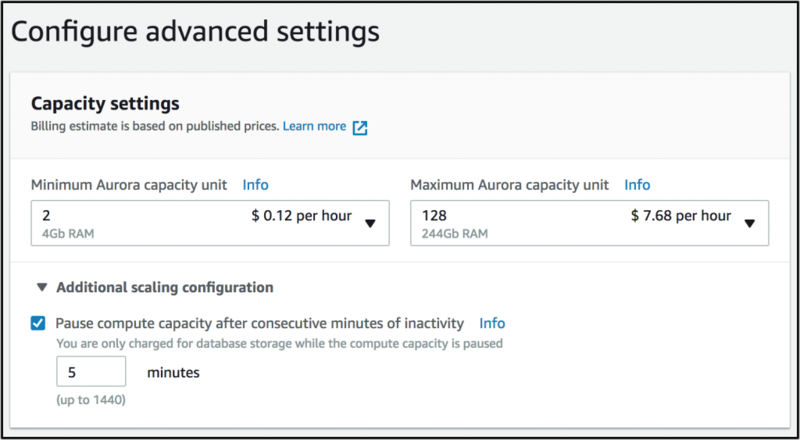 October – Amazon Aurora on R4 Instances. November – Amazon RDS for MySQL and MariaDB on R4, T2, and M4 Instance Types. November – Amazon RDS for SQL Server on R4 and M4 Instance Types. December – Amazon RDS for PostgreSQL on R4, T2, and M4 Instance Types. July – Price Reduction for R3 Instances running SQL Server Enterprise License Included. I’m pretty sure that’s everything. As you can see, 2017 was quite the year! I can’t wait to see what the team delivers in 2018. 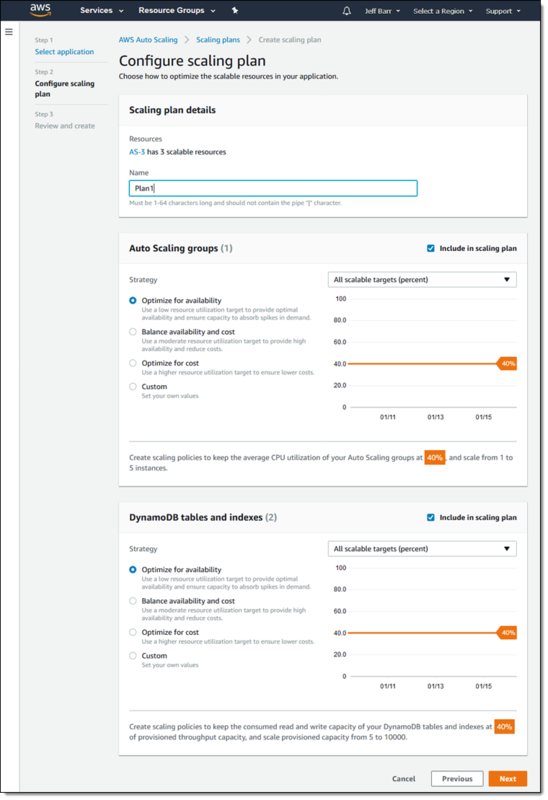 Today we are making it easier for you to use the Auto Scaling features of multiple AWS services from a single user interface with the introduction of AWS Auto Scaling. This new service unifies and builds on our existing, service-specific, scaling features. It operates on any desired EC2 Auto Scaling groups, EC2 Spot Fleets, ECS tasks, DynamoDB tables, DynamoDB Global Secondary Indexes, and Aurora Replicas that are part of your application, as described by an AWS CloudFormation stack or in AWS Elastic Beanstalk (we’re also exploring some other ways to flag a set of resources as an application for use with AWS Auto Scaling). We are launching AWS Auto Scaling today in the US East (Northern Virginia), US East (Ohio), US West (Oregon), EU (Ireland), and Asia Pacific (Singapore) Regions today, with more to follow. 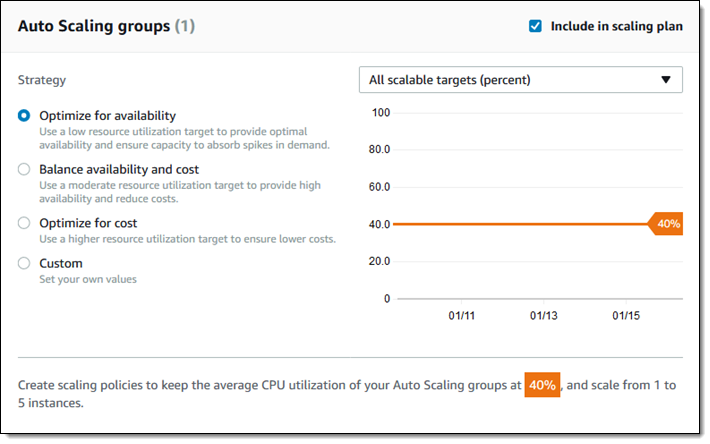 There’s no charge for AWS Auto Scaling; you pay only for the CloudWatch Alarms that it creates and any AWS resources that you consume. This post courtesy of Shane Baldacchino, Solutions Architect at Amazon Web Services. Many customers ask for guidance on migrating end-to-end solutions running on virtual machines over to AWS. 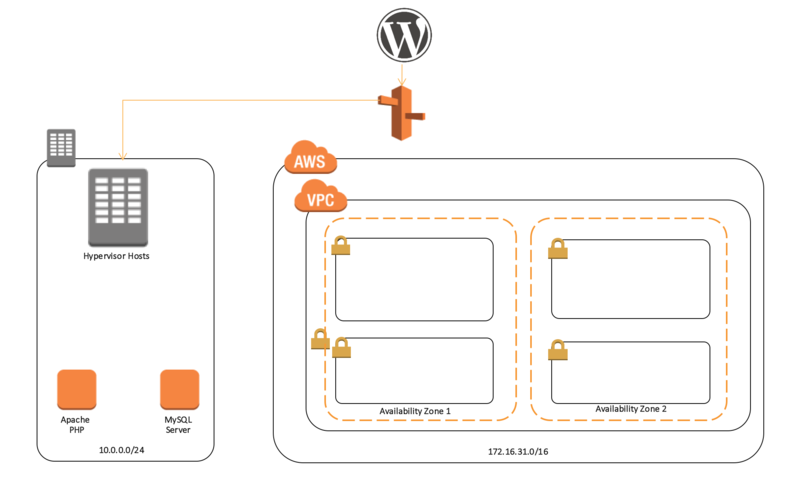 This post provides an overview of moving a common WordPress blog running on a virtualized platform to AWS, including re-pointing the DNS records associated to with the website. AWS Server Migration Service (AWS SMS) is an agentless service that makes it easier and faster for you to migrate thousands of on-premises workloads to AWS. AWS SMS allows you to automate, schedule, and track incremental replications of live server volumes, making it easier for you to coordinate large-scale server migrations. Configure AWS SMS and Hypervisor permissions. Before you start, ensure that your source systems OS and vCenter version are supported by AWS. For more information, see the Server Migration Service FAQ. For this walkthrough, your WordPress blog is currently running as a two-tier LAMP stack in a corporate data center. You have a frontend running Apache and PHP, plus a backend database running on MySQL. All systems are hosted on a virtualized platform. First, establish your AWS environment. If your organization is new to AWS, this may include account or subaccount creation, a new virtual private cloud (VPC), and associated subnets, route tables, internet gateways, and so on. Think of this phase as setting up your software-defined data center. 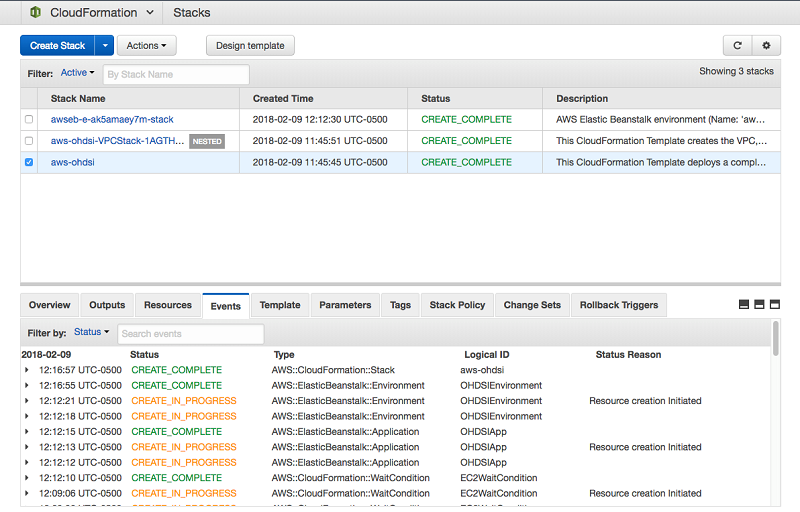 For more information, see Getting Started with Amazon EC2. The blog is a two-tier stack, so go with two private subnets. Because you want it to be highly available, use multiple Availability Zones. A zone resides within an AWS Region. Each zone is isolated, but the zones within a region are connected through low-latency links. This allows architects and solution designers to build highly available solutions. WordPress uses a MySQL relational database. You could continue to manage MySQL and the associated EC2 instances associated with maintaining and scaling a database. 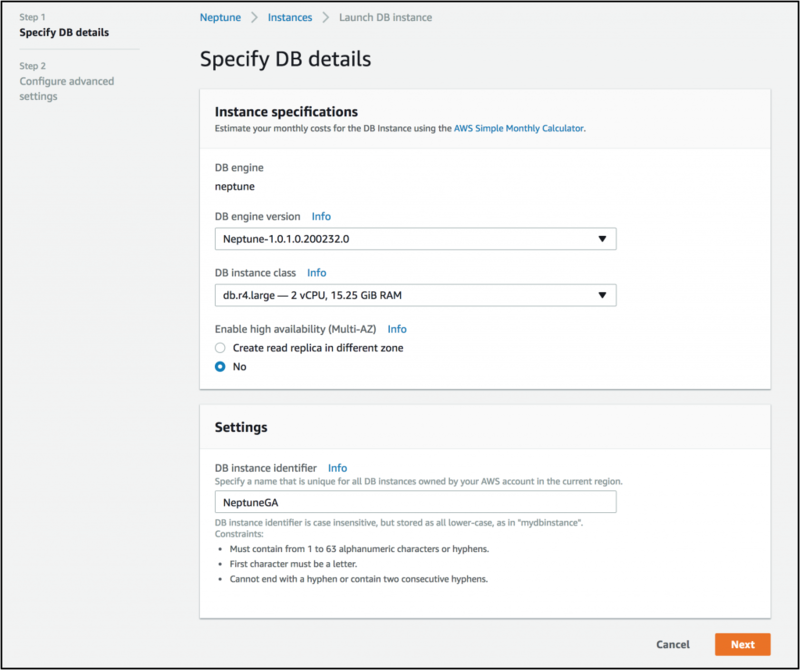 For this walkthrough, use this opportunity to migrate to an RDS instance of Amazon Aurora, as it is a MySQL compliant database. Not only is Amazon Aurora a high-performant database engine but it frees you up to focus on application development by managing time-consuming database administration tasks, including backups, software patching, monitoring, scaling, and replication. Use AWS Database Migration Service to migrate your MySQL database to Amazon Aurora easily and securely. After a database migration instance has been instantiated, configure the source and destination endpoints and create a replication task. By attaching to the MySQL binlog, you can seed in the current data in the database and also capture all future state changes in near real time. 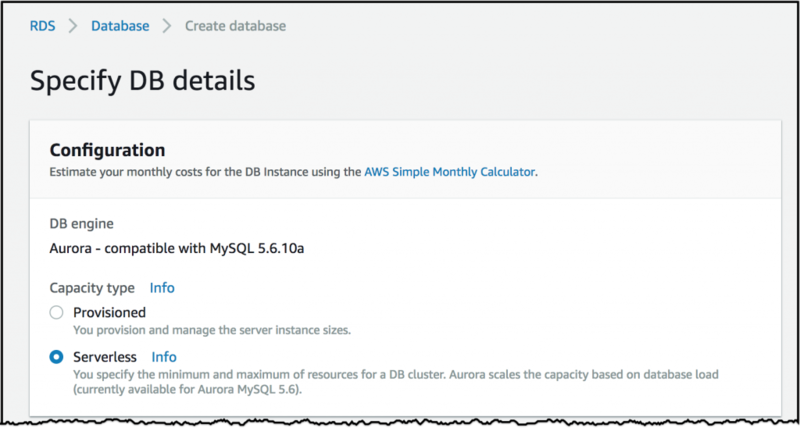 For more information, see Migrating a MySQL-Compatible Database to Amazon Aurora. Now, use AWS SMS to migrate your Apache PHP frontend to EC2. AWS SMS is delivered as an appliance for your hypervisor. To download the SMS Connector, log in to the console and choose Server Migration Service, Connectors, SMS Connector setup guide. Your hypervisor and AWS SMS will need an appropriate user with sufficient privileges to perform migrations. AWS SMS – Use the AWS CLI or the IAM console to create an IAM user with the ServerMigrationConnector policy attached. 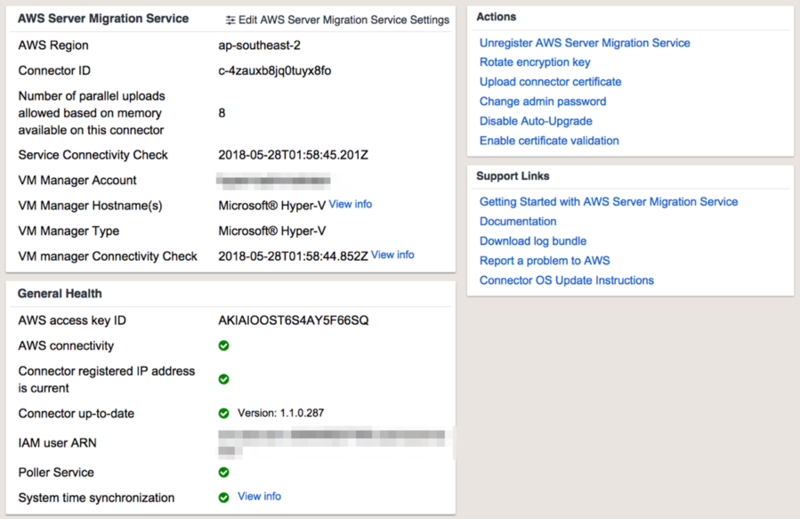 Hypervisor – Follow the specific instructions for your hypervisor in the Getting Started with AWS Server Migration Service. Launch a new VM based on the SMS Connector that you downloaded. To configure the connector, connect to it via HTTPS. You can obtain the SMS Connector IP address from your hypervisor. Connect to the SMS Connector via HTTPS. In the example above, the connector IP address is 10.0.0.31. In your browser, enter https://10.0.0.31. After it’s configured, and the associated connectivity and authentication checks have passed, return to the console and view your connector in AWS SMS. 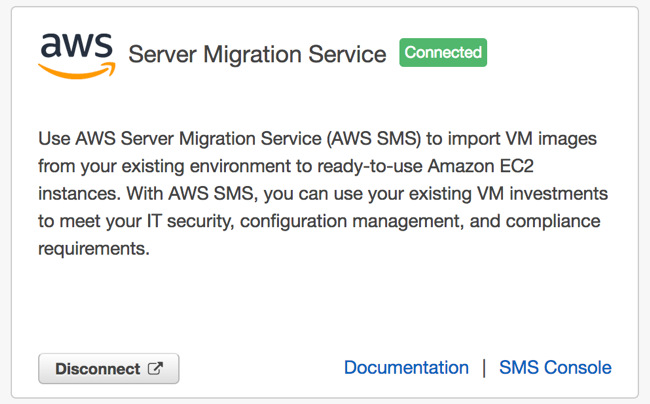 After validating that the SMS Connector is in a “HEALTHY” state, import your server catalog to AWS SMS. This process can take up to a minute. 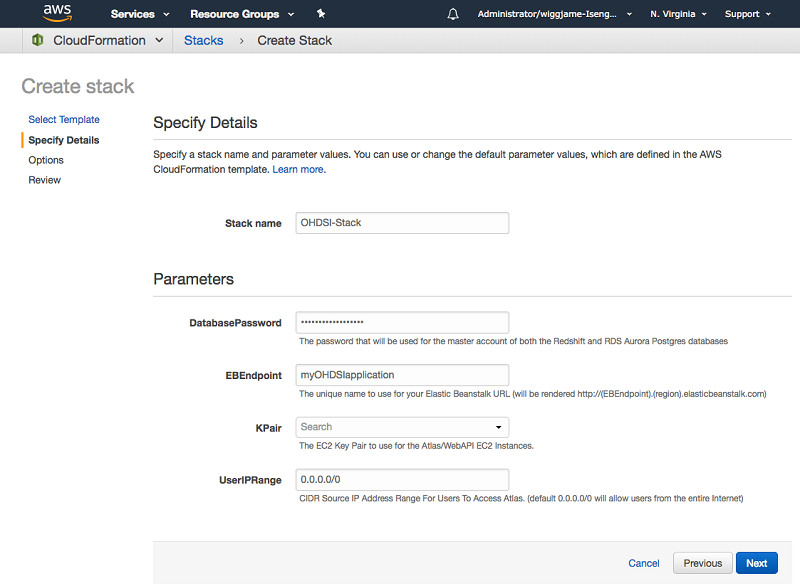 When your replication task is complete, the artifact created by AWS SMS is a custom AMI that you can use to deploy an EC2 instance. 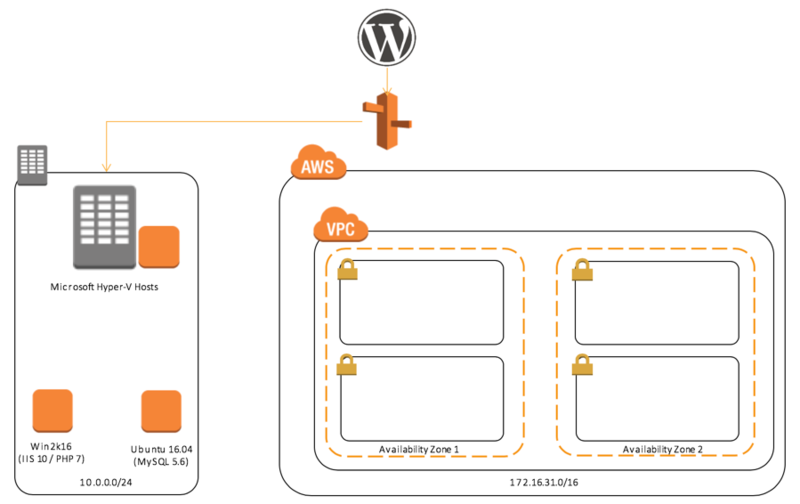 Follow the usual process to launch your EC2 instance, noting that you may need to replace any host-based firewalls with security groups and NACLs. While your new EC2 instance is a replica of your on-premises VM, you should always validate that applications are functioning. How you do this differs on an application-by-application basis. You can use a combination of approaches, such as editing a local host file and testing your application, SSH, or Telnet. 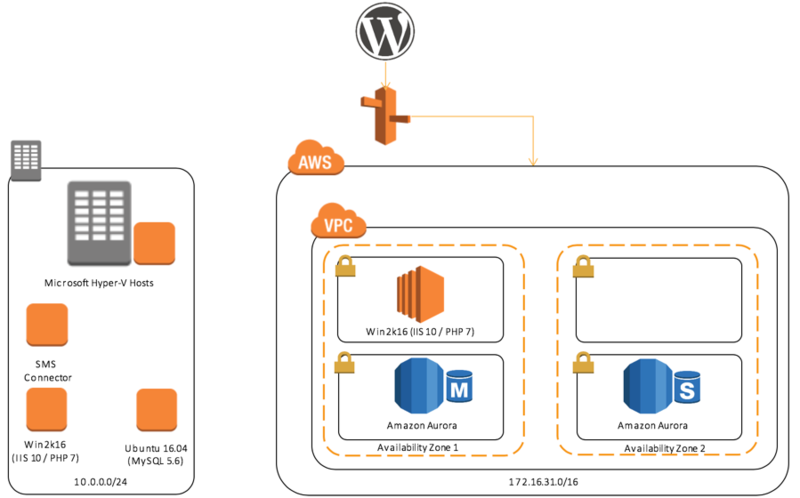 You have validated that your WordPress application is running correctly, as you are still receiving changes from your on-premises data center via AWS DMS into your Amazon Aurora database. You can now update your DNS zone file using Amazon Route 53. Route 53 can be driven by multiple methods: console, SDK, or AWS CLI. For this walkthrough, update your DNS zone file via the AWS CLI. 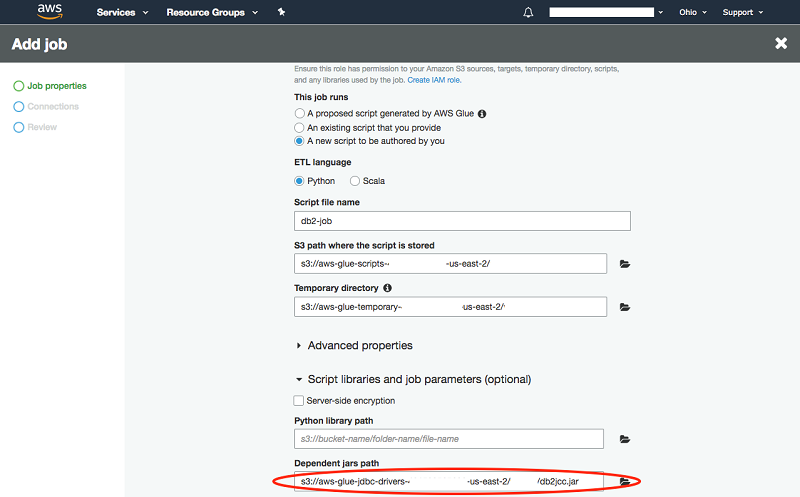 The JSON example shows upserting the A record in your zone to resolve to your EC2 instance. 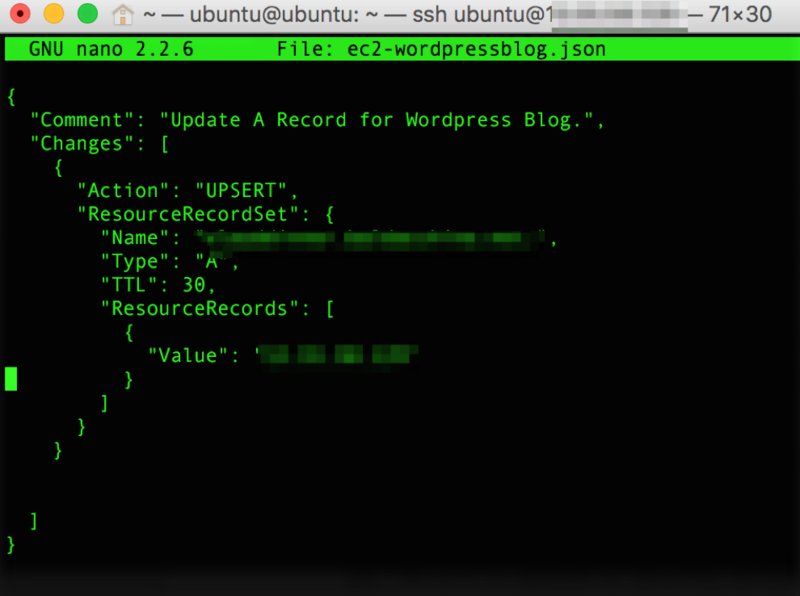 Use the AWS CLI to execute the request and update the record in your zone file. The cut-over period between the original off-cloud location and AWS is defined by the TTL in the SOA (statement of authority) in your DNS zone. 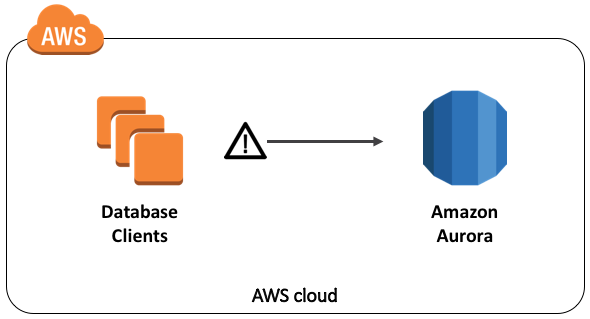 During this period, any requests resolving to your off-cloud server that result in database writes are automatically replicated to your Amazon Aurora instance via AWS DMS. 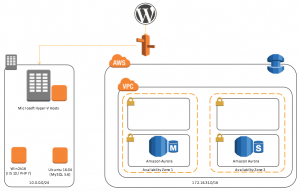 You have now successfully migrated your WordPress blog to AWS. 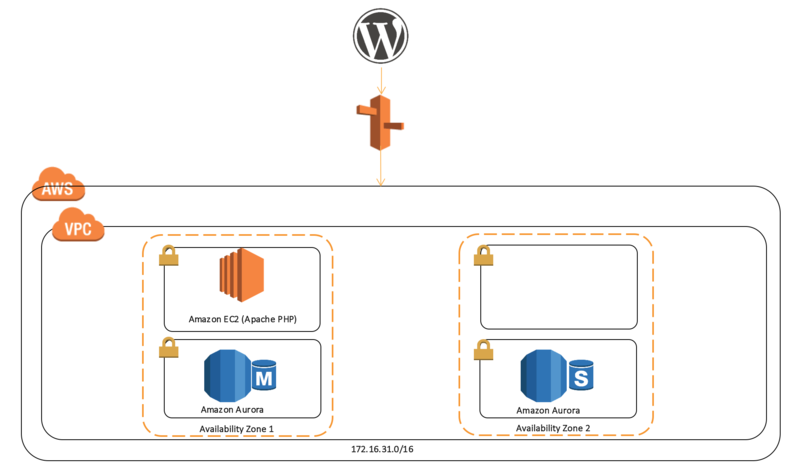 Based on the TTL of your DNS zone file, end users slowly resolve the WordPress blog to AWS. After you have validated your successful migration, be sure to delete your AWS DMS task and your AWS SMS replication job. 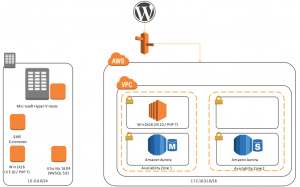 In this post, you moved a WordPress blog to AWS, using AWS SMS and AWS DMS to re-point the associated DNS records. 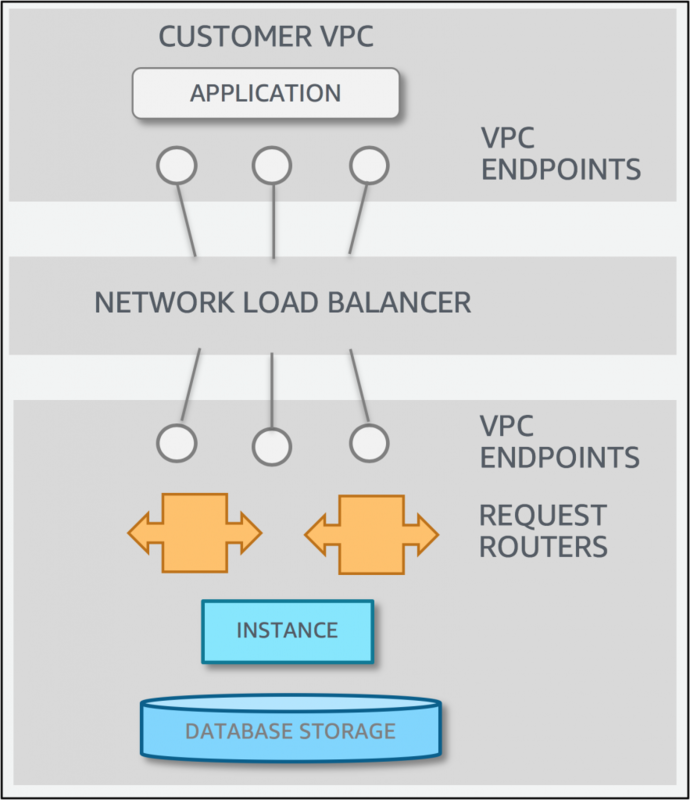 Many architectures can be extended to use many of the inherent benefits of AWS, with little effort. For example, by using Amazon CloudWatch metrics to drive Auto Scaling policies, you can use an Application Load Balancer as your frontend. This removes the single point of failure for a single Amazon EC2 instance and ensures that your deployed capacity closely follows customer demand. Think big and get building! Happy New Year! Kick of 2018 right by expanding your AWS knowledge with a great batch of new Tech Talks. We’re covering some of the biggest launches from re:Invent including Amazon Neptune, Amazon Rekognition Video, AWS Fargate, AWS Cloud9, Amazon Kinesis Video Streams, AWS PrivateLink, AWS Single-Sign On and more! Noted below are the upcoming scheduled live, online technical sessions being held during the month of January. Make sure to register ahead of time so you won’t miss out on these free talks conducted by AWS subject matter experts. 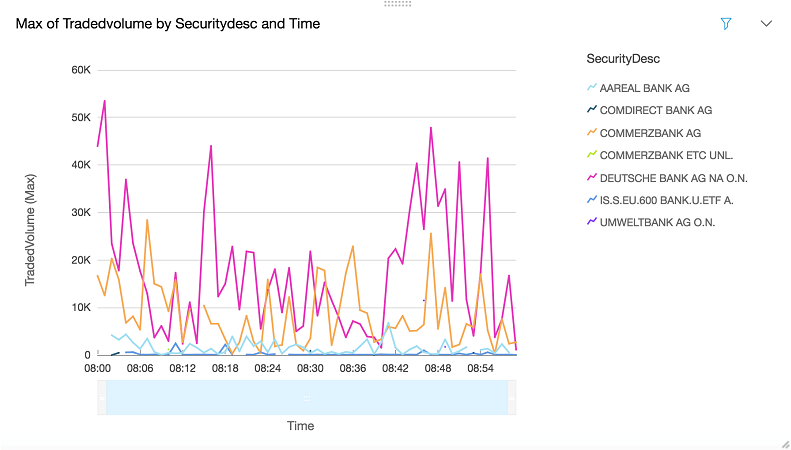 A few months ago, we published a blog post about capturing data changes in an Amazon Aurora database and sending it to Amazon Athena and Amazon QuickSight for fast analysis and visualization. In this post, I want to demonstrate how easy it can be to take the data in Aurora and combine it with data in Amazon Redshift using Amazon Redshift Spectrum. With Amazon Redshift, you can build petabyte-scale data warehouses that unify data from a variety of internal and external sources. Because Amazon Redshift is optimized for complex queries (often involving multiple joins) across large tables, it can handle large volumes of retail, inventory, and financial data without breaking a sweat. 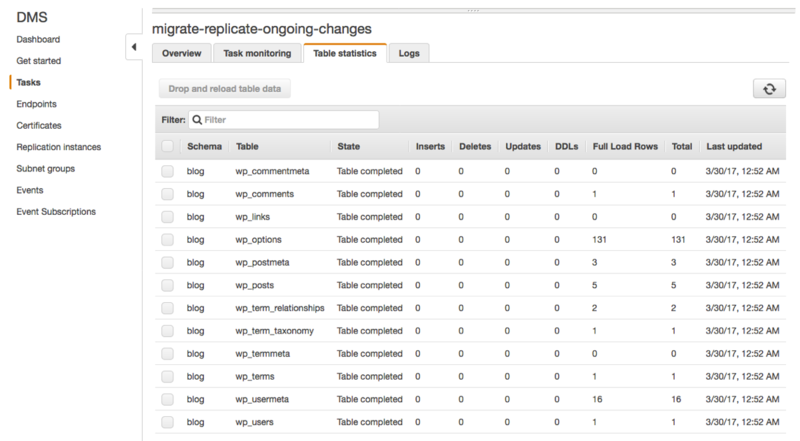 Use AWS Lambda functions with Amazon Aurora to capture data changes in a table. Query data using Amazon Redshift Spectrum. Consider a scenario in which an e-commerce web application uses Amazon Aurora for a transactional database layer. The company has a sales table that captures every single sale, along with a few corresponding data items. This information is stored as immutable data in a table. Business users want to monitor the sales data and then analyze and visualize it. In this example, you take the changes in data in an Aurora database table and save it in Amazon S3. After the data is captured in Amazon S3, you combine it with data in your existing Amazon Redshift cluster for analysis. By the end of this post, you will understand how to capture data events in an Aurora table and push them out to other AWS services using AWS Lambda. The starting point in this architecture is a database insert operation in Amazon Aurora. When the insert statement is executed, a custom trigger calls a Lambda function and forwards the inserted data. Lambda writes the data that it received from Amazon Aurora to a Kinesis data delivery stream. Kinesis Data Firehose writes the data to an Amazon S3 bucket. Once the data is in an Amazon S3 bucket, it is queried in place using Amazon Redshift Spectrum. 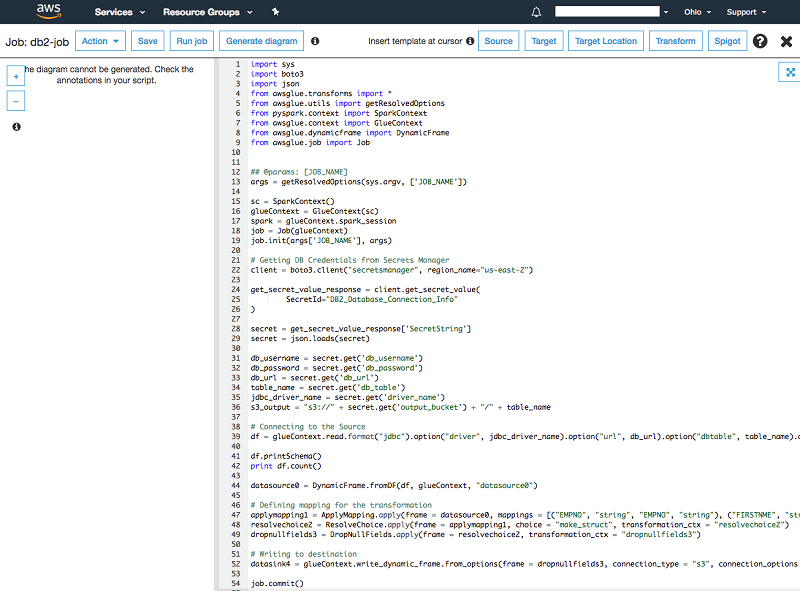 Sign in to the AWS Management Console, and open the Amazon RDS console. Choose Launch a DB instance, and choose Next. 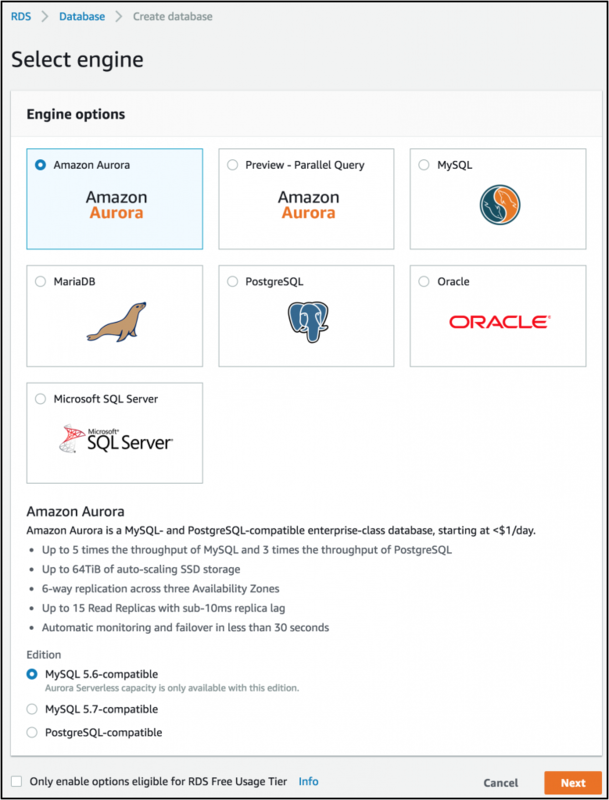 For Engine, choose Amazon Aurora. Choose a DB instance class. This example uses a small, since this is not a production database. In Multi-AZ deployment, choose No. 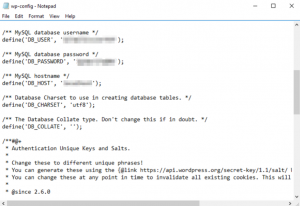 Configure DB instance identifier, Master username, and Master password. After you create the database, use MySQL Workbench to connect to the database using the CNAME from the console. For information about connecting to an Aurora database, see Connecting to an Amazon Aurora DB Cluster. You can now populate the table with some sample data. To generate sample data in your table, copy and run the following script. Ensure that the highlighted (bold) variables are replaced with appropriate values. 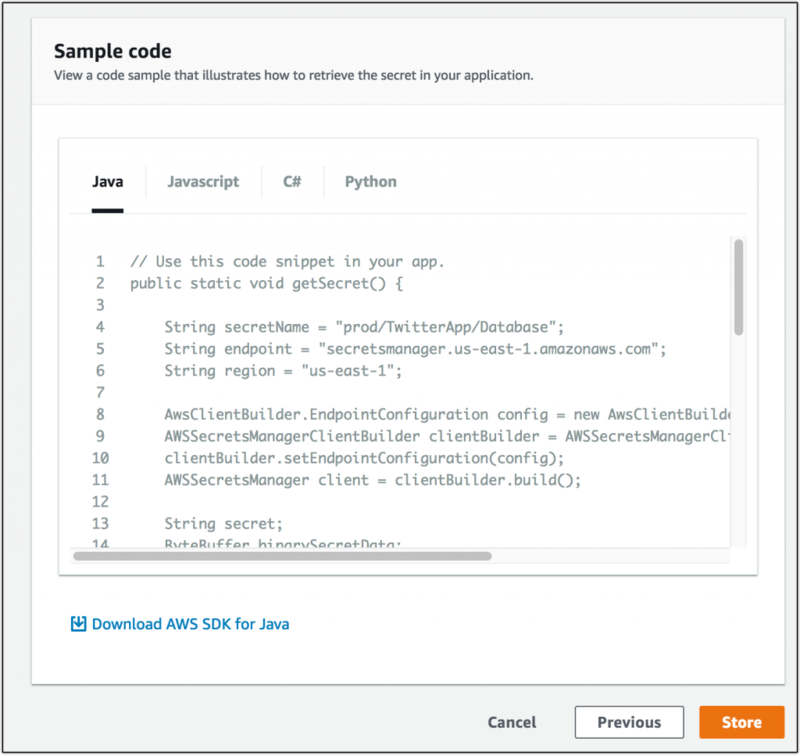 add_order = ("INSERT INTO Sales "
To demonstrate the ease of setting up integration between multiple AWS services, we use a Lambda function to send data to Amazon S3 using Amazon Kinesis Data Firehose. 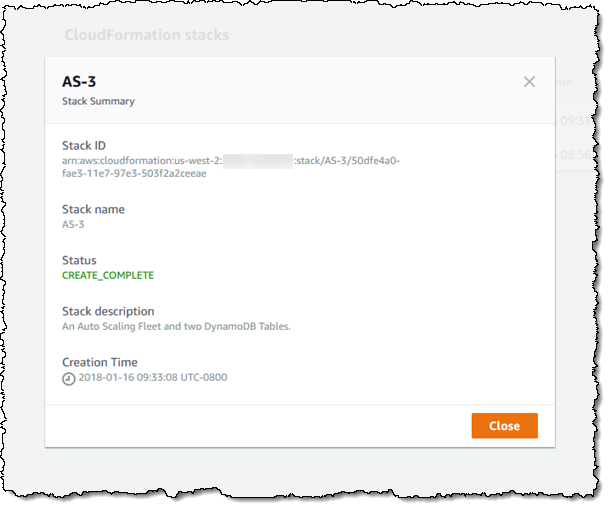 Alternatively, you can use a SELECT INTO OUTFILE S3 statement to query data from an Amazon Aurora DB cluster and save it directly in text files that are stored in an Amazon S3 bucket. However, with this method, there is a delay between the time that the database transaction occurs and the time that the data is exported to Amazon S3 because the default file size threshold is 6 GB. The next step is to create a Kinesis data delivery stream, since it’s a dependency of the Lambda function. For Delivery stream name, type AuroraChangesToS3. For Source, choose Direct PUT. For Record transformation, choose Disabled. For Destination, choose Amazon S3. In the S3 bucket drop-down list, choose an existing bucket, or create a new one. Enter a prefix if needed, and choose Next. For Data compression, choose GZIP. In IAM role, choose either an existing role that has access to write to Amazon S3, or choose to generate one automatically. Choose Next. Review all the details on the screen, and choose Create delivery stream when you’re finished. Now you can create a Lambda function that is called every time there is a change that needs to be tracked in the database table. This Lambda function passes the data to the Kinesis data delivery stream that you created earlier. Ensure that you are in the AWS Region where your Amazon Aurora database is located. If you have no Lambda functions yet, choose Get started now. Otherwise, choose Create function. Choose Next on the trigger selection screen. Paste the following code in the code window. Change the stream_name variable to the Kinesis data delivery stream that you created in the previous step. Choose File -> Save in the code editor and then choose Save. Note the Amazon Resource Name (ARN) of this Lambda function. 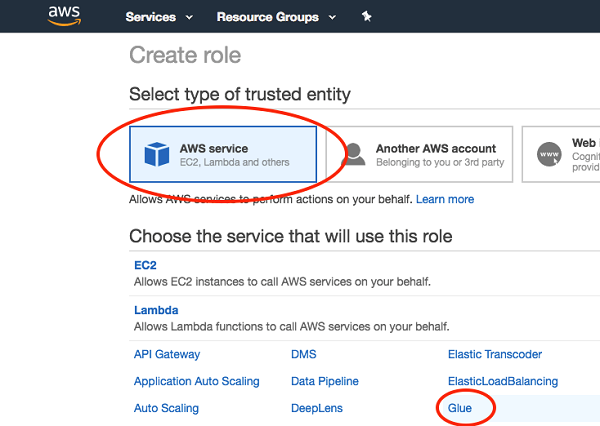 To give Amazon Aurora permissions to invoke a Lambda function, you must attach an IAM role with appropriate permissions to the cluster. 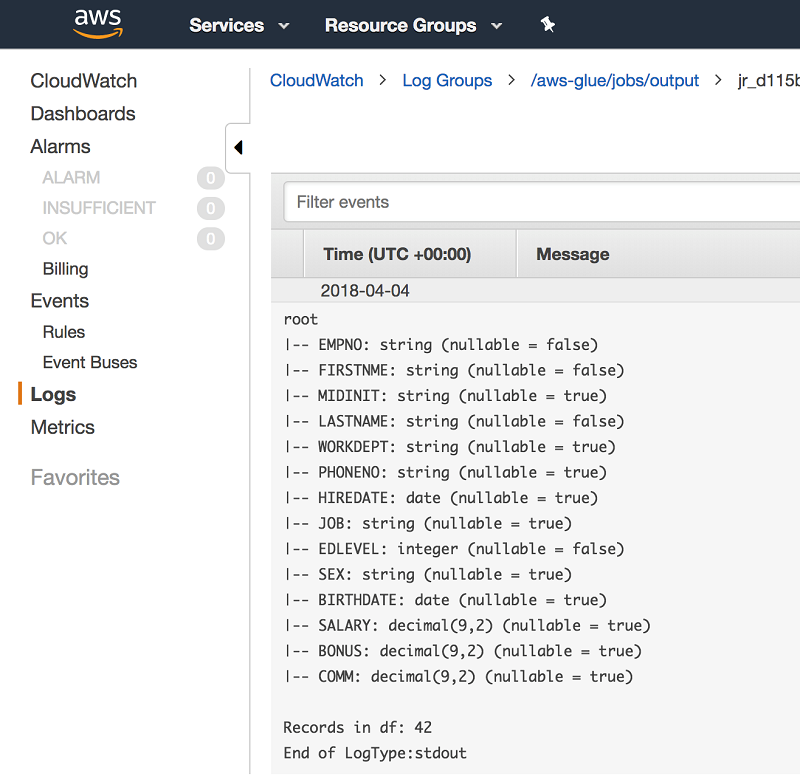 For more information, see Invoking a Lambda Function from an Amazon Aurora DB Cluster. Once you are finished, the Amazon Aurora database has access to invoke a Lambda function. Now, go back to MySQL Workbench, and run the following command to create a new stored procedure. When this stored procedure is called, it invokes the Lambda function you created. Change the ARN in the following code to your Lambda function’s ARN. Create a trigger TR_Sales_CDC on the Sales table. When a new record is inserted, this trigger calls the CDC_TO_FIREHOSE stored procedure. 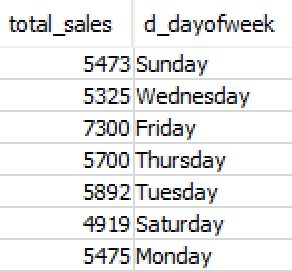 If a new row is inserted in the Sales table, the Lambda function that is mentioned in the stored procedure is invoked. Verify that data is being sent from the Lambda function to Kinesis Data Firehose to Amazon S3 successfully. You might have to insert a few records, depending on the size of your data, before new records appear in Amazon S3. This is due to Kinesis Data Firehose buffering. To learn more about Kinesis Data Firehose buffering, see the “Amazon S3” section in Amazon Kinesis Data Firehose Data Delivery. 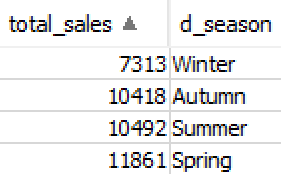 Every time a new record is inserted in the sales table, a stored procedure is called, and it updates data in Amazon S3. 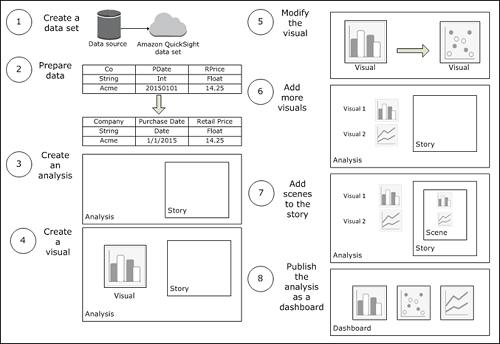 In this section, you use the data you produced from Amazon Aurora and consume it as-is in Amazon Redshift. In order to allow you to process your data as-is, where it is, while taking advantage of the power and flexibility of Amazon Redshift, you use Amazon Redshift Spectrum. 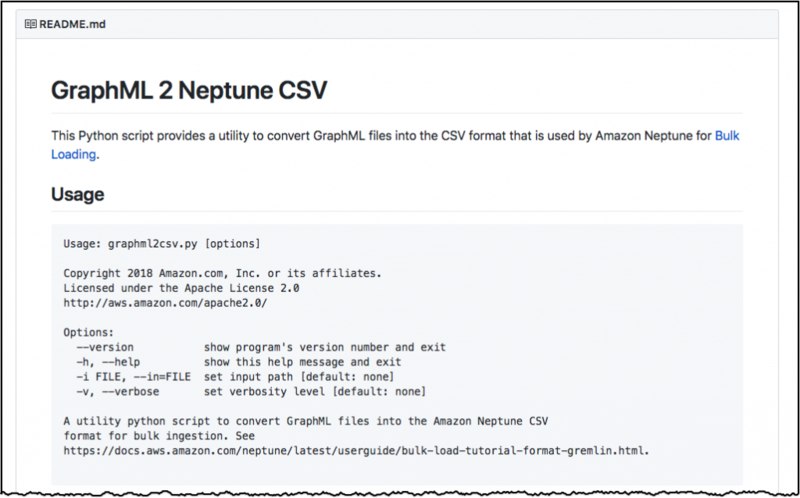 You can use Redshift Spectrum to run complex queries on data stored in Amazon S3, with no need for loading or other data prep. Just create a data source and issue your queries to your Amazon Redshift cluster as usual. Behind the scenes, Redshift Spectrum scales to thousands of instances on a per-query basis, ensuring that you get fast, consistent performance even as your dataset grows to beyond an exabyte! Being able to query data that is stored in Amazon S3 means that you can scale your compute and your storage independently. You have the full power of the Amazon Redshift query model and all the reporting and business intelligence tools at your disposal. Your queries can reference any combination of data stored in Amazon Redshift tables and in Amazon S3. Redshift Spectrum supports open, common data types, including CSV/TSV, Apache Parquet, SequenceFile, and RCFile. Files can be compressed using gzip or Snappy, with other data types and compression methods in the works. 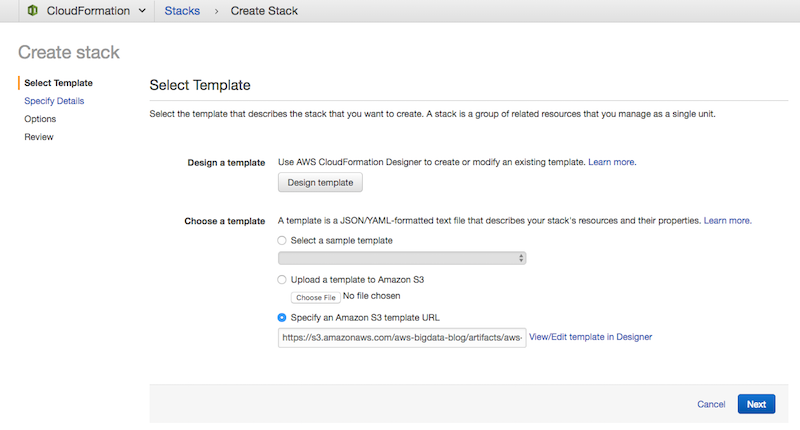 First, create an Amazon Redshift cluster. Follow the steps in Launch a Sample Amazon Redshift Cluster. Next, create an IAM role that has access to Amazon S3 and Athena. 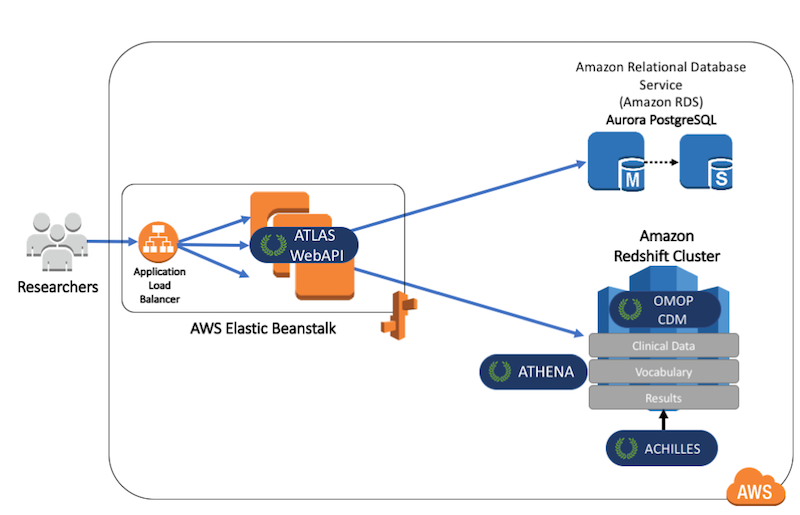 By default, Amazon Redshift Spectrum uses the Amazon Athena data catalog. 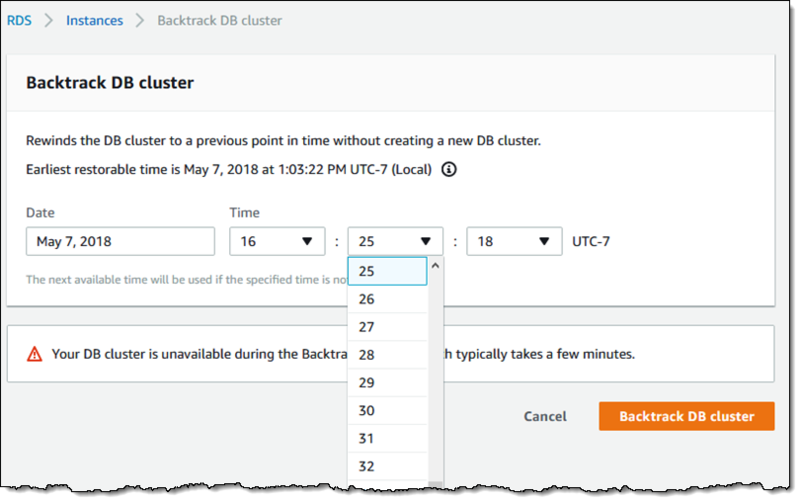 Your cluster needs authorization to access your external data catalog in AWS Glue or Athena and your data files in Amazon S3. In the demo setup, I attached AmazonS3FullAccess and AmazonAthenaFullAccess. In a production environment, the IAM roles should follow the standard security of granting least privilege. For more information, see IAM Policies for Amazon Redshift Spectrum. 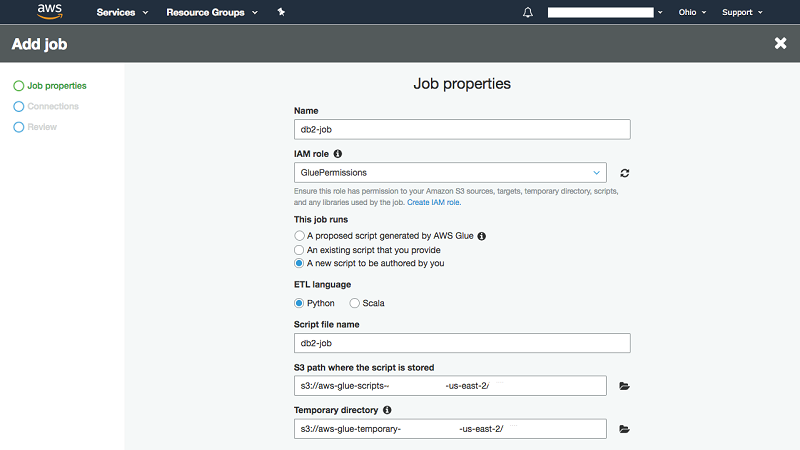 Attach the newly created role to the Amazon Redshift cluster. For more information, see Associate the IAM Role with Your Cluster. Don’t forget to replace the IAM role in the statement. Query the table, and it should contain data. This is a fact table. With Amazon Redshift Spectrum, you pay only for the queries you run against the data that you actually scan. We encourage you to use file partitioning, columnar data formats, and data compression to significantly minimize the amount of data scanned in Amazon S3. This is important for data warehousing because it dramatically improves query performance and reduces cost. Partitioning your data in Amazon S3 by date, time, or any other custom keys enables Amazon Redshift Spectrum to dynamically prune nonrelevant partitions to minimize the amount of data processed. If you store data in a columnar format, such as Parquet, Amazon Redshift Spectrum scans only the columns needed by your query, rather than processing entire rows. Similarly, if you compress your data using one of the supported compression algorithms in Amazon Redshift Spectrum, less data is scanned. 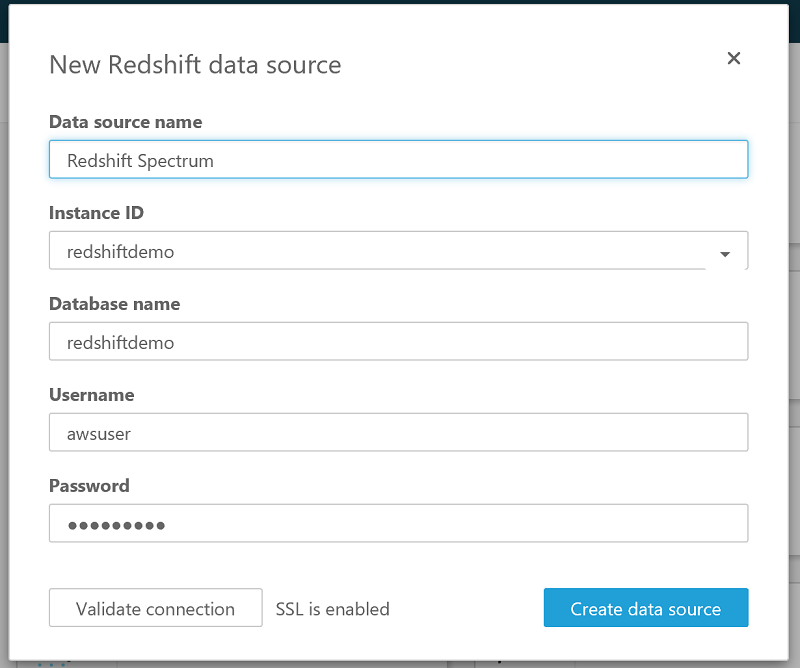 Modify the Amazon Redshift security group to allow an Amazon QuickSight connection. 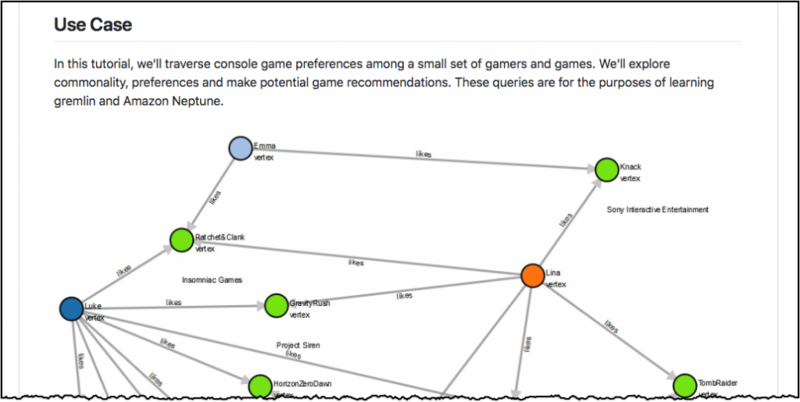 For more information, see Authorizing Connections from Amazon QuickSight to Amazon Redshift Clusters. 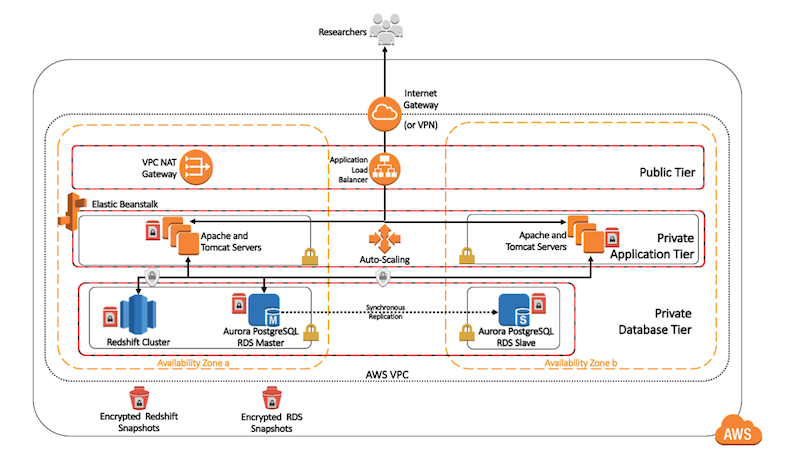 After modifying the Amazon Redshift security group, go to Amazon QuickSight. Create a new analysis, and choose Amazon Redshift as the data source. Enter the database connection details, validate the connection, and create the data source. Choose the schema to be analyzed. In this case, choose spectrum_schema, and then choose the ecommerce_sales table. Next, we add a custom field for Total Sales = Price*Quantity. 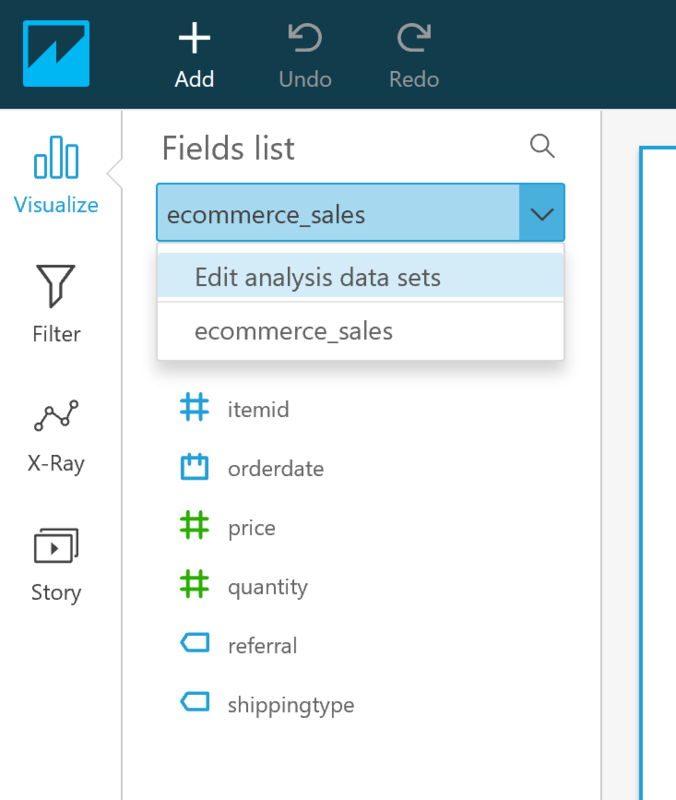 In the drop-down list for the ecommerce_sales table, choose Edit analysis data sets. On the next screen, choose Edit. In the data prep screen, choose New Field. 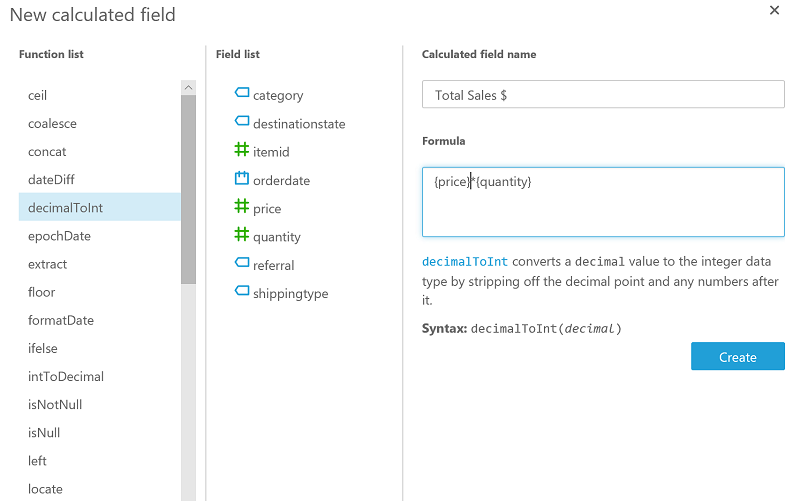 Add a new calculated field Total Sales $, which is the product of the Price*Quantity fields. Then choose Create. Save and visualize it. 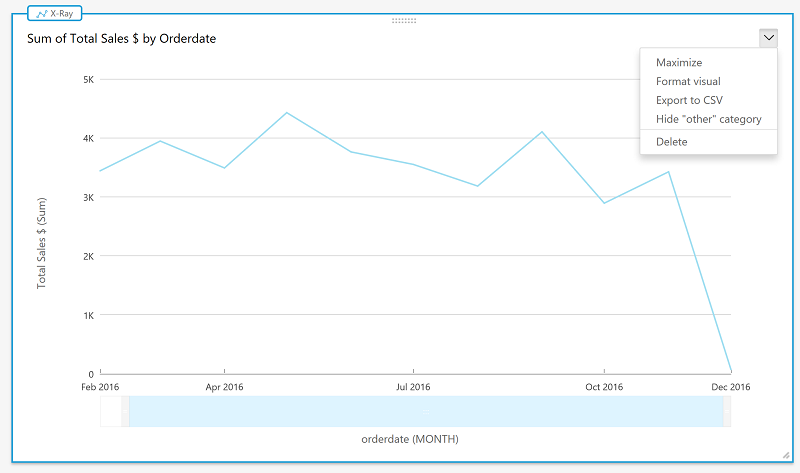 Next, to visualize total sales figures by month, create a graph with Total Sales on the x-axis and Order Data formatted as month on the y-axis. 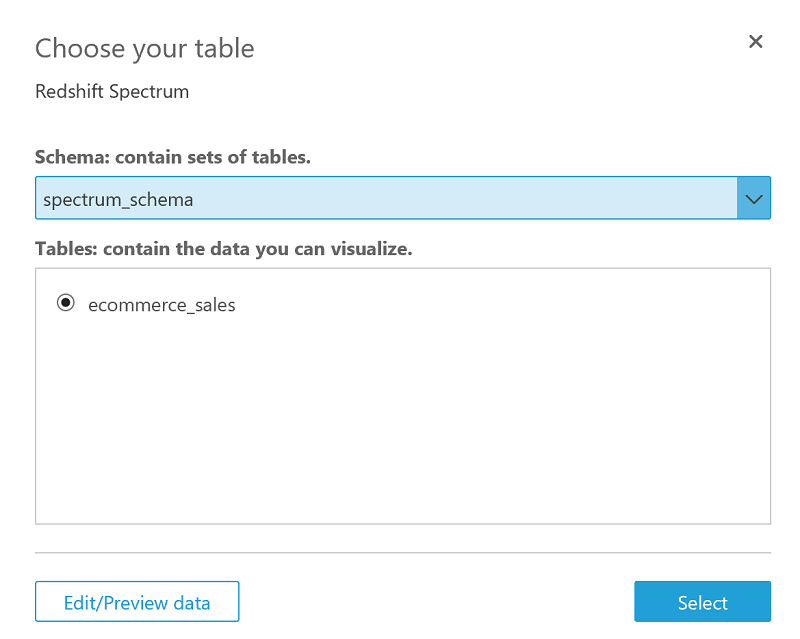 After you’ve finished, you can use Amazon QuickSight to add different columns from your Amazon Redshift tables and perform different types of visualizations. You can build operational dashboards that continuously monitor your transactional and analytical data. You can publish these dashboards and share them with others. 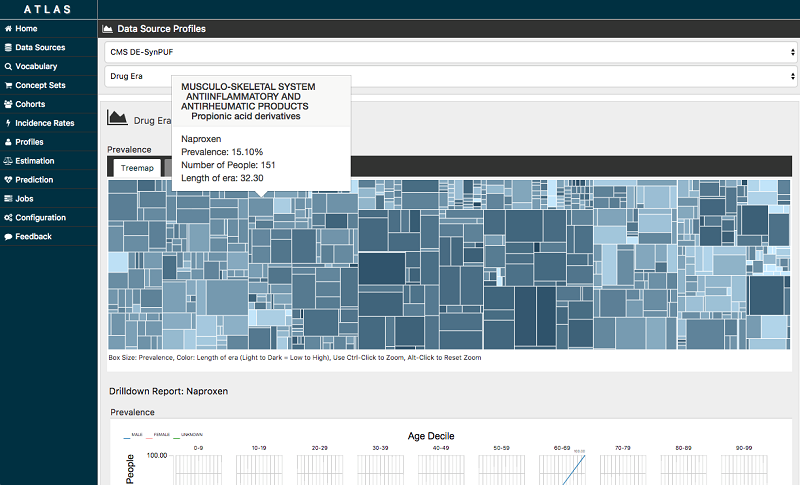 Amazon QuickSight can also read data in Amazon S3 directly. 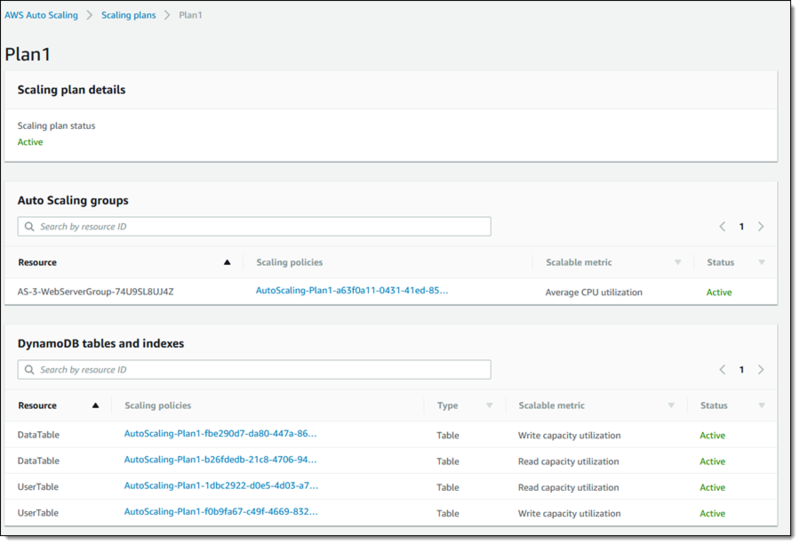 However, with the method demonstrated in this post, you have the option to manipulate, filter, and combine data from multiple sources or Amazon Redshift tables before visualizing it in Amazon QuickSight. In this example, we dealt with data being inserted, but triggers can be activated in response to an INSERT, UPDATE, or DELETE trigger. 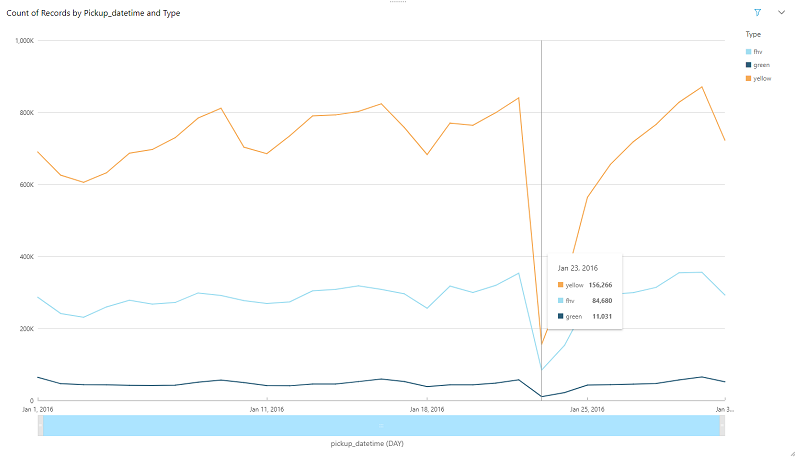 Be careful when invoking a Lambda function from triggers on tables that experience high write traffic. This would result in a large number of calls to your Lambda function. Although calls to the lambda_async procedure are asynchronous, triggers are synchronous. A statement that results in a large number of trigger activations does not wait for the call to the AWS Lambda function to complete. But it does wait for the triggers to complete before returning control to the client. Similarly, you must account for Amazon Kinesis Data Firehose limits. By default, Kinesis Data Firehose is limited to a maximum of 5,000 records/second. 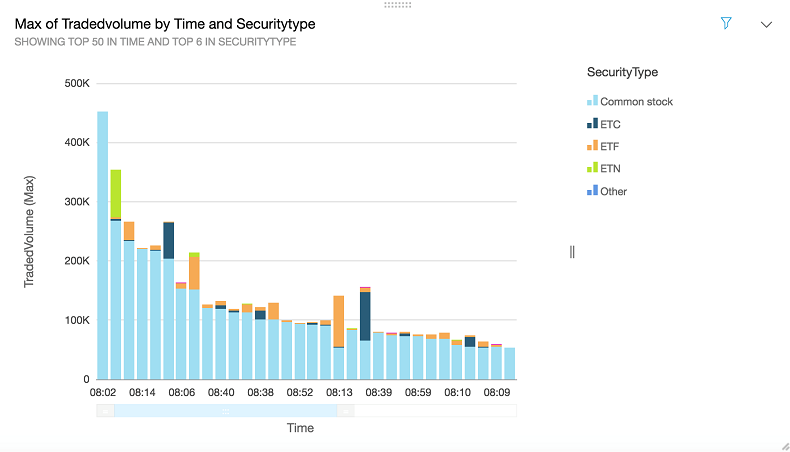 For more information, see Monitoring Amazon Kinesis Data Firehose. In certain cases, it may be optimal to use AWS Database Migration Service (AWS DMS) to capture data changes in Aurora and use Amazon S3 as a target. For example, AWS DMS might be a good option if you don’t need to transform data from Amazon Aurora. The method used in this post gives you the flexibility to transform data from Aurora using Lambda before sending it to Amazon S3. Additionally, the architecture has the benefits of being serverless, whereas AWS DMS requires an Amazon EC2 instance for replication. For design considerations while using Redshift Spectrum, see Using Amazon Redshift Spectrum to Query External Data. Re Alvarez-Parmar is a solutions architect for Amazon Web Services. He helps enterprises achieve success through technical guidance and thought leadership. In his spare time, he enjoys spending time with his two kids and exploring outdoors.